For Halloween this year, we all went with Harry Potter costumes (which I am very excited about). 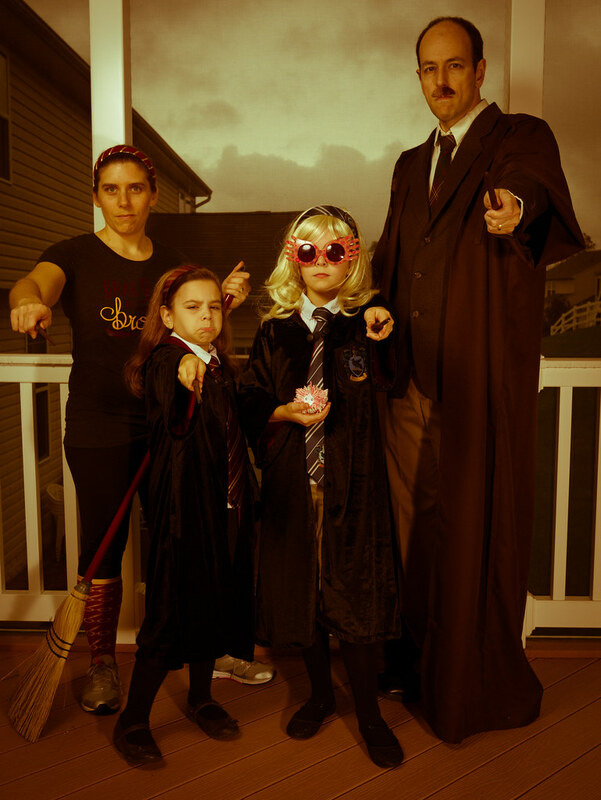 I am Remus Lupin (possibly my favorite character), Molly is Luna Lovegood, Leah is Hermione Granger, and Jen is a Quidditch fan. The girls really got into character. 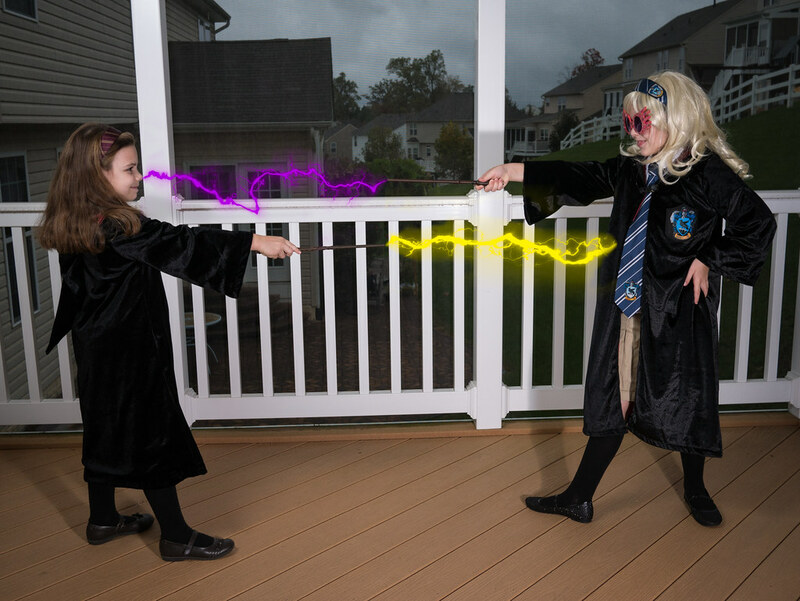 They even had a wizard duel. And they cast their spells. I don’t think they’re trying to hurt each other, given the smiles on their faces. 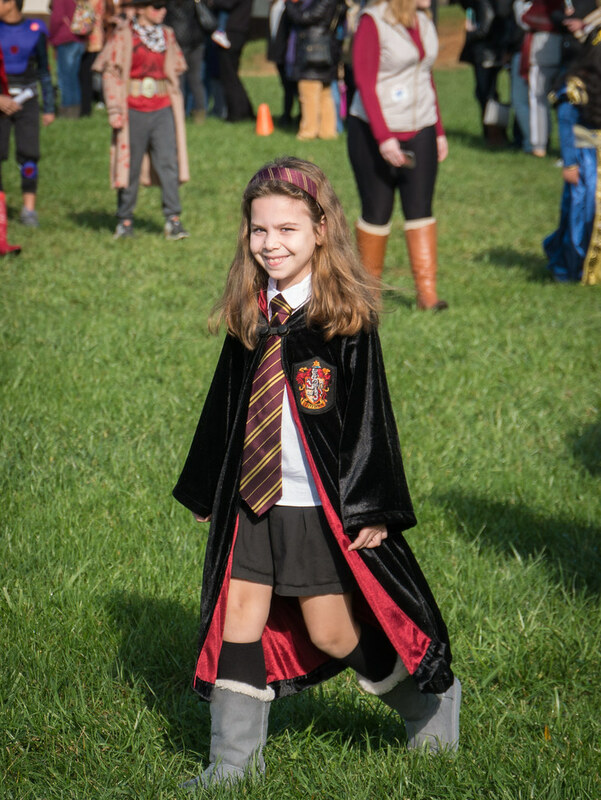 On Halloween day, the girls had a Halloween parade at school as usual. 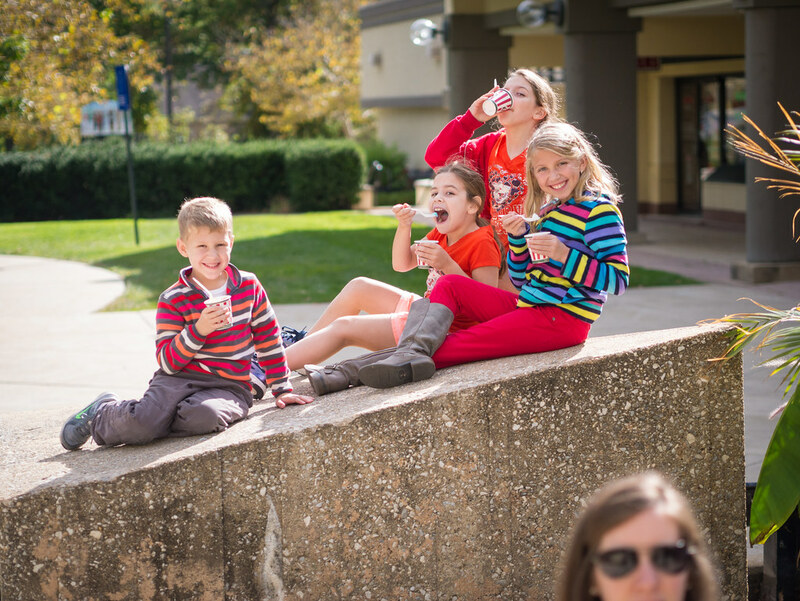 Then they had their class parties. And perhaps even took some time to learn something afterward. As evening approached, it was time for some serious trick-or-treating. 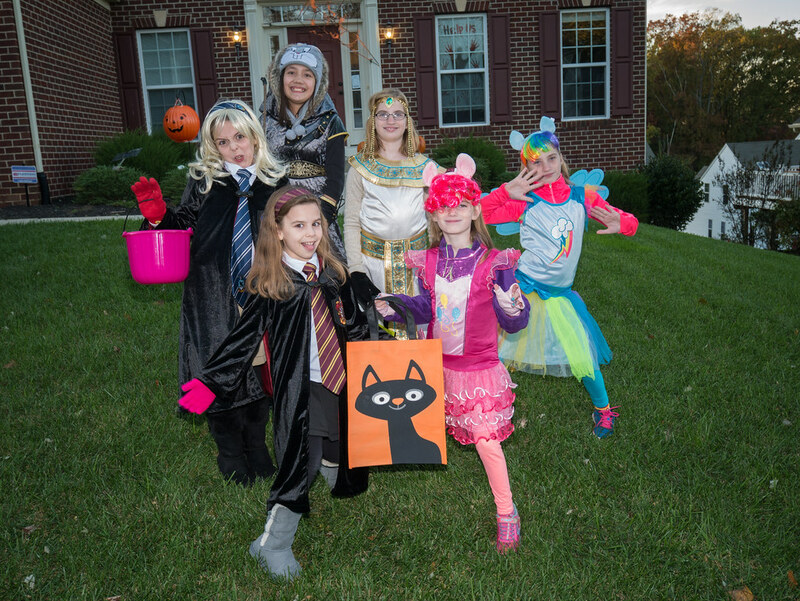 This year, Molly’s friend Grace joined our crew of trick-or-treaters. We trick-or-treated for about an hour. Jen handed out candy this year while I walked around with the girls. 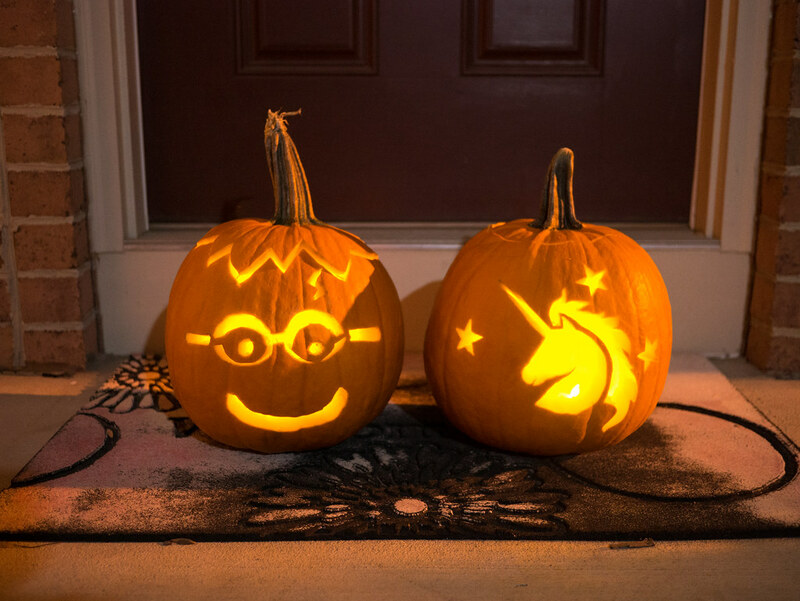 We didn’t have very many trick-or-treaters visit us early on, so we thought it might be a light Halloween. 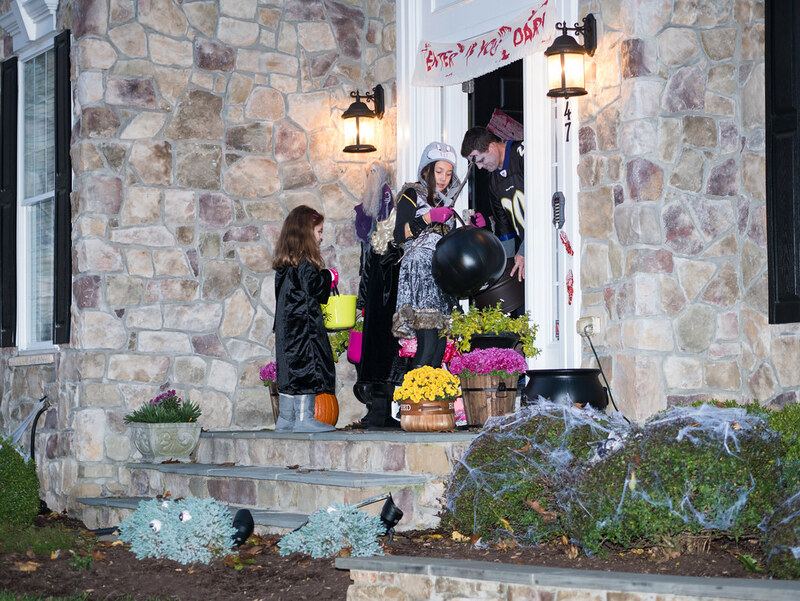 But eventually they showed up, totaling 139 trick-or-treaters this year. After returning home, Grace really wanted to keep going. Leah was done, but Molly agreed to go back out after thirty minutes of warming up and eating candy. So, Grace, Molly, and I headed back out to a street further than we've been before. 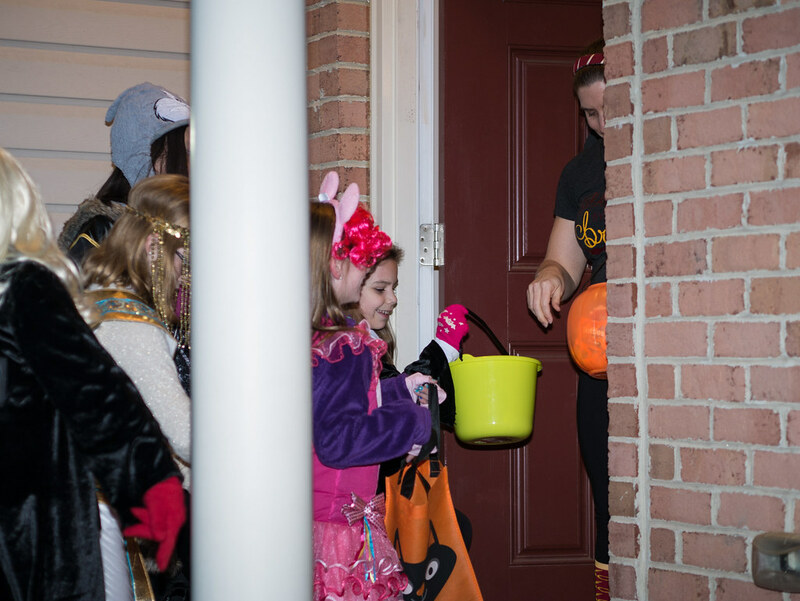 This was later than we’ve trick-or-treated before, and Molly learned that late-night trick-or-treating can be awesome as folks are trying to unload candy. Every time someone said “just take a couple handfuls” she was very happy. 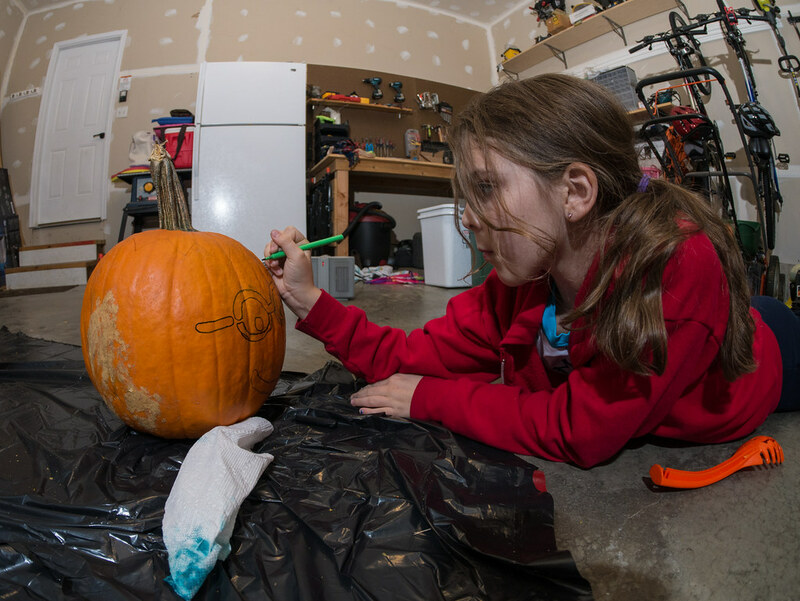 She ended up filling up her pumpkin twice by the end of the night. 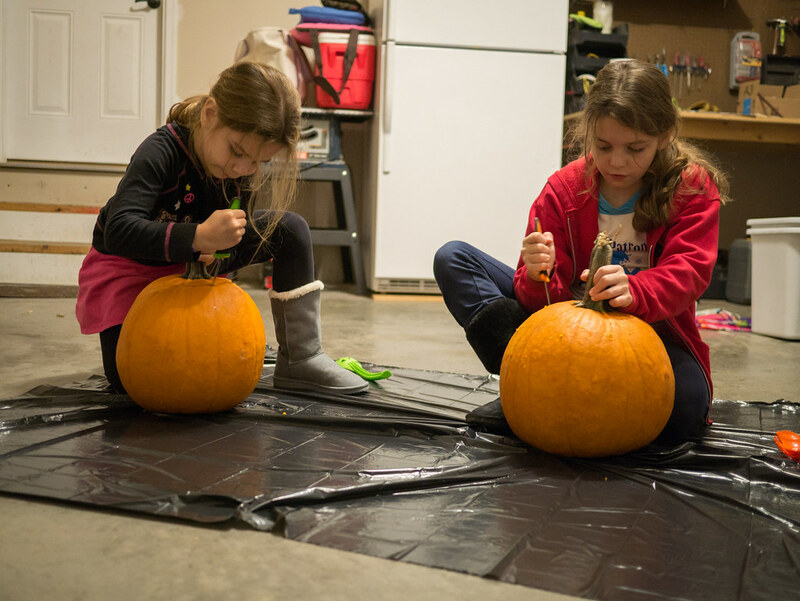 We’ve been really busy of late, and failed to get to carving pumpkins until our last chance. So, Monday night (October 30), after homework was finished, we finally tackled them. 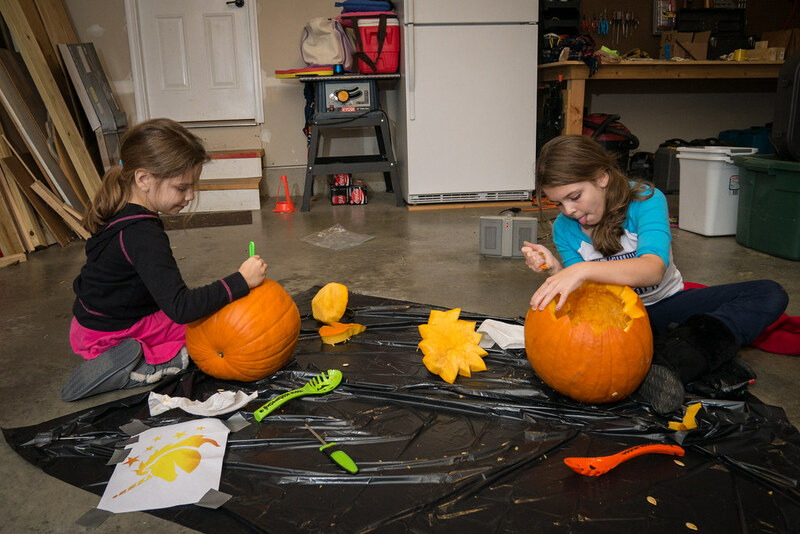 The girls started the pumpkin carving off by cutting open the tops. 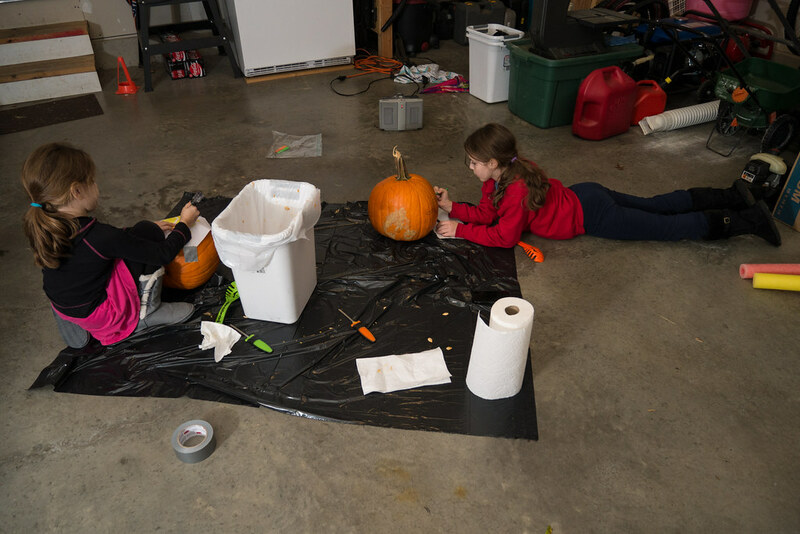 After scooping the guts out, the girls both applied their designs. 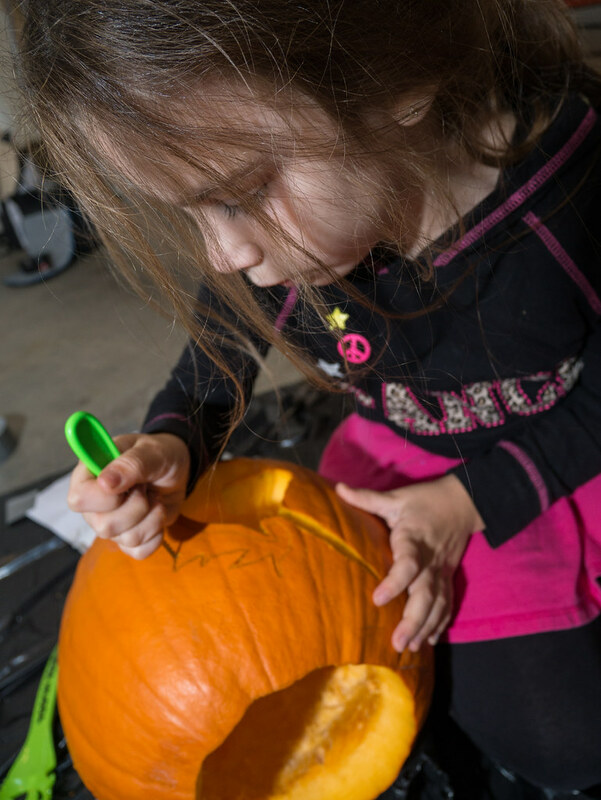 Leah opted for a unicorn printout which she transferred to the pumpkin by poking holes through it with an awl. 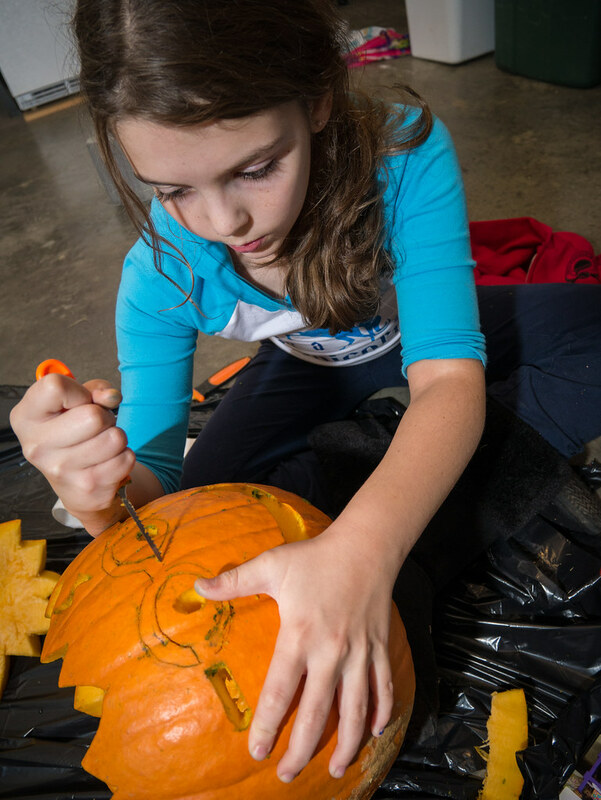 Molly had a Harry Potter pumpkin photo she found that she free-hand drew on her pumpkin. Molly had to be really careful with the Harry Potter glasses, as they have large pieces that are only attached by a small bit. 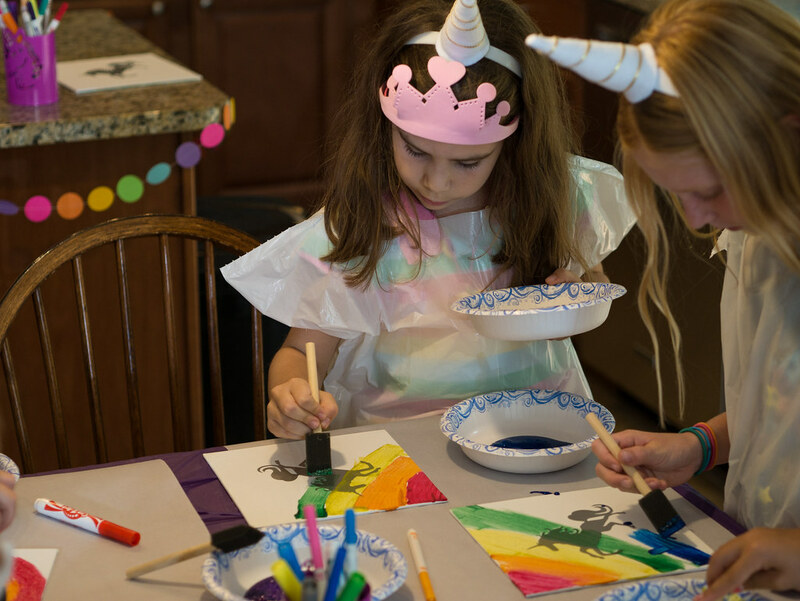 Leah had lots of zig-zags in her unicorn’s mane. 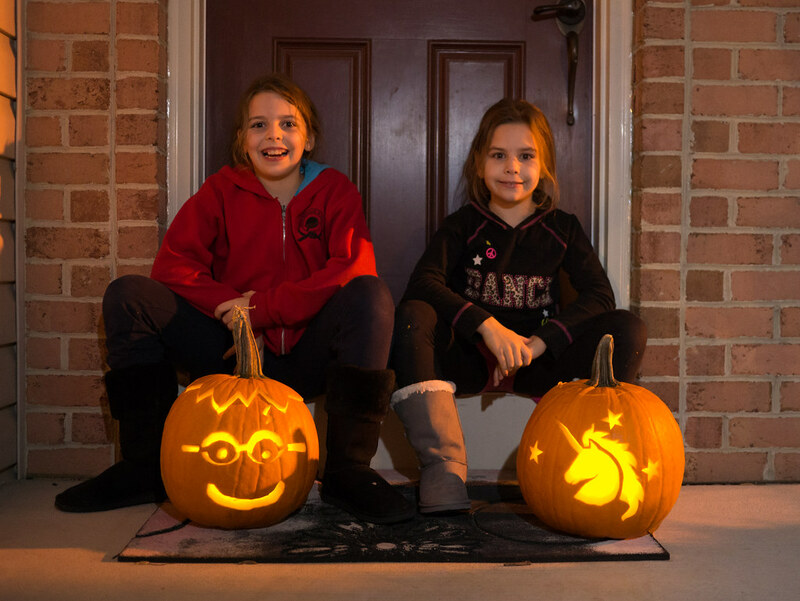 And here are their finished products - Molly’s Harry Potter pumpkin and Leah’s unicorn pumpkin. It may have taken us a long time for finally go to our local Six Flags, but it didn’t take long before we headed back again. Six Flags had a Bring a Friend Free day, and Zach and Stacie were kind enough to offer to bring us. So, after church we headed there for fun again. After lunch, our first stop was the Ragin Cajun. The dads got to ride as well, though we were relegated to the car after the kids. 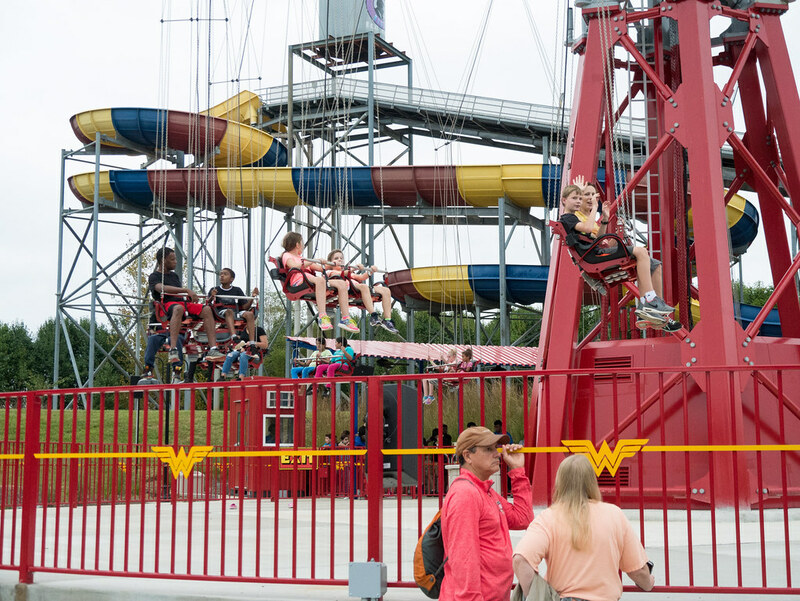 The ride Leah most wanted to ride again was Wonder Woman. Jen and I were again happy to stand by and not ride this high spinner. We rode lots of other rides, but I didn’t get pictures of them as most of them were the same ones we rode before. 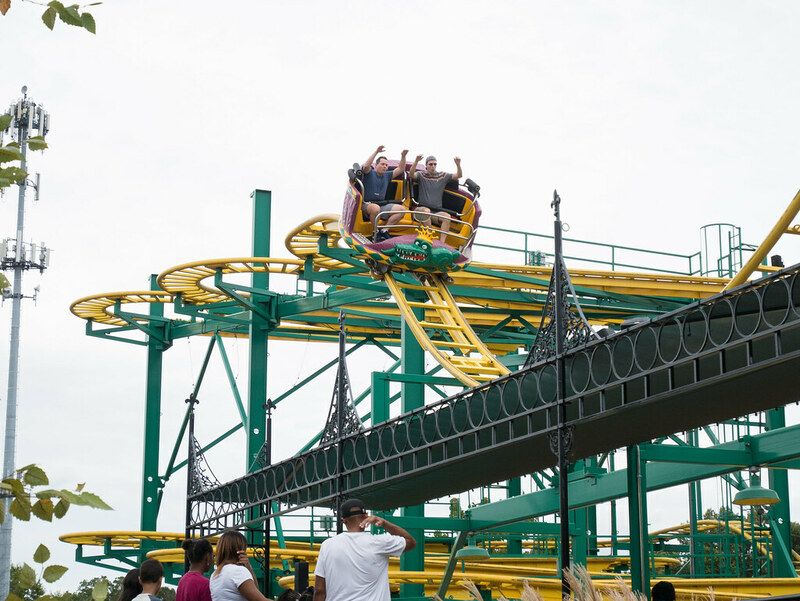 Molly continued loving roller coasters, and even added one beyond what she’d rode before. She was worried about riding Apocalypse (it’s a standing coaster), and said she didn’t want to ride it. Then Stacie bet her a dollar to ride it, and she of course did. She ended up saying it was her favorite ride of the day, and we ended up riding it a second time on the way out. We left the park right as Fright Fest was starting, and our girls were ready to get out of the park then. 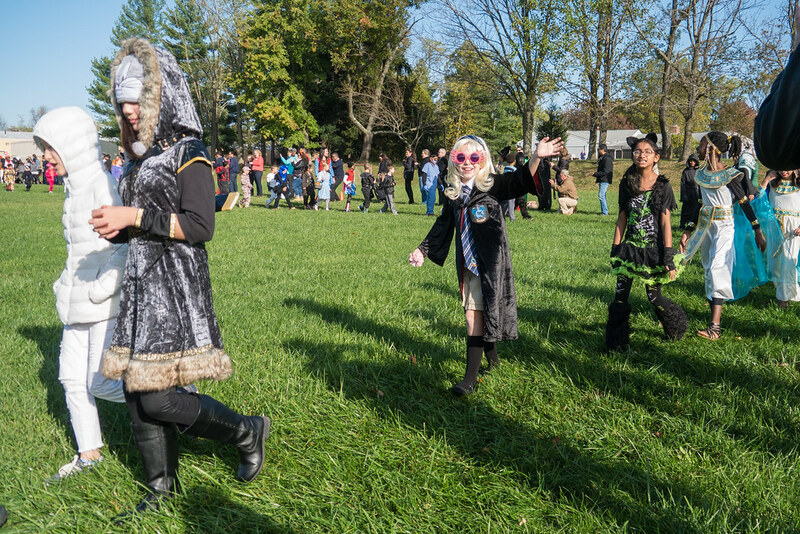 Lots of zombies and other scary folks start wandering the park terrorizing guests, which was not their idea of fun. Next time we may have to leave a couple minutes earlier to avoid them entirely. Thanks so much to Zach and Stacie for bringing us along. 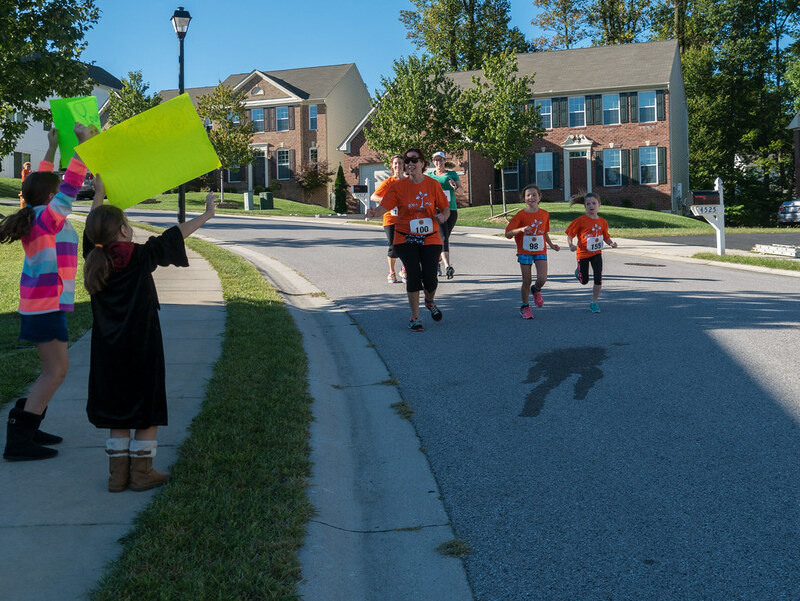 While our visitors were in town, our church held their annual 5K. It was a beautiful day (much better than last year, when it started pouring rain half-way through the race). I had hoped to get others in my family to join me in the run, but no one wanted to take on the very hilly course. So, I headed off by myself. That doesn’t mean the kids didn’t get involved in the race, though. The 5K runs right by our house. 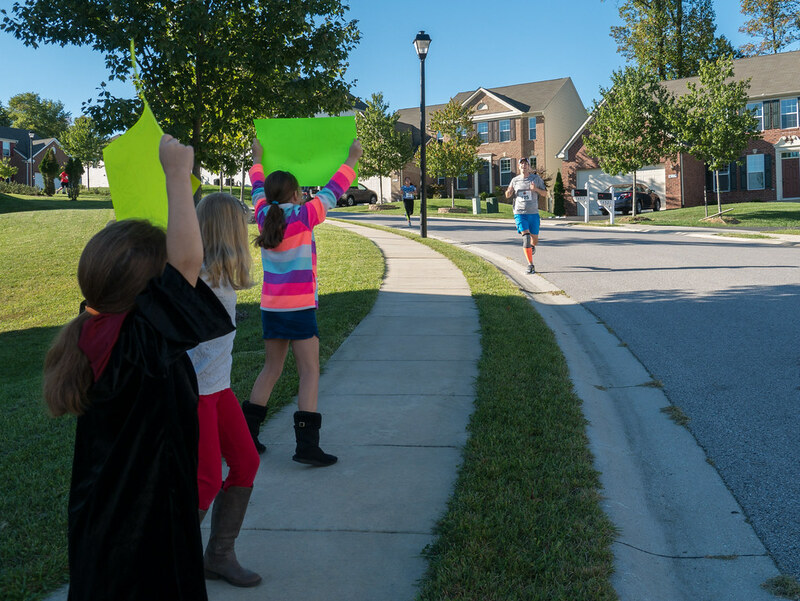 The kids decided to make signs and come out to cheer me (and the rest of the racers) on. I got a nice boost of energy from my cheering section as I ran by. My family didn’t run, but some of their friends did. Simon and Ben ran by too quickly to be photographed (they actually ended up first and second in their age group), but Jen did get a picture of Matilda, Stacie, and Julie. In September we had visitors from a far away land. Emmie, JJ, Aunt ‘Chelle, and Uncle J flew up to spend a couple days with us. 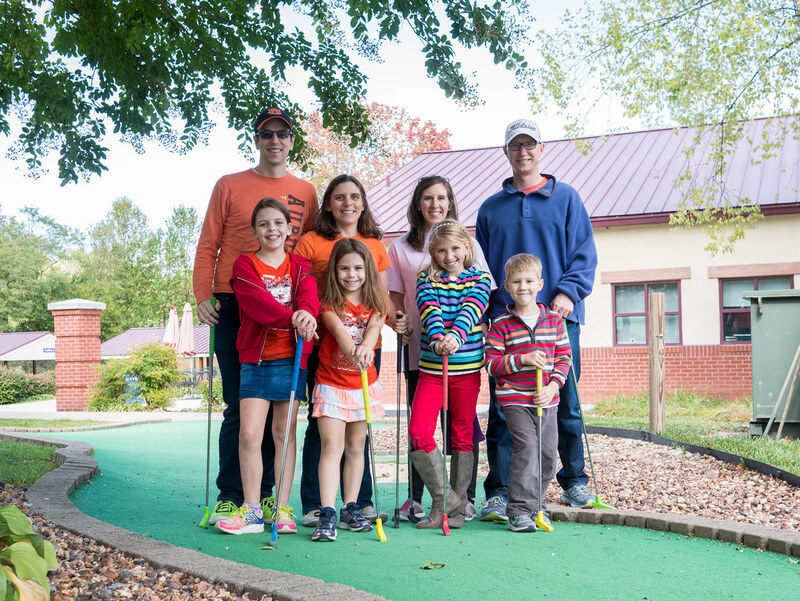 While they were here, we went for a fun outing of putt-putt. 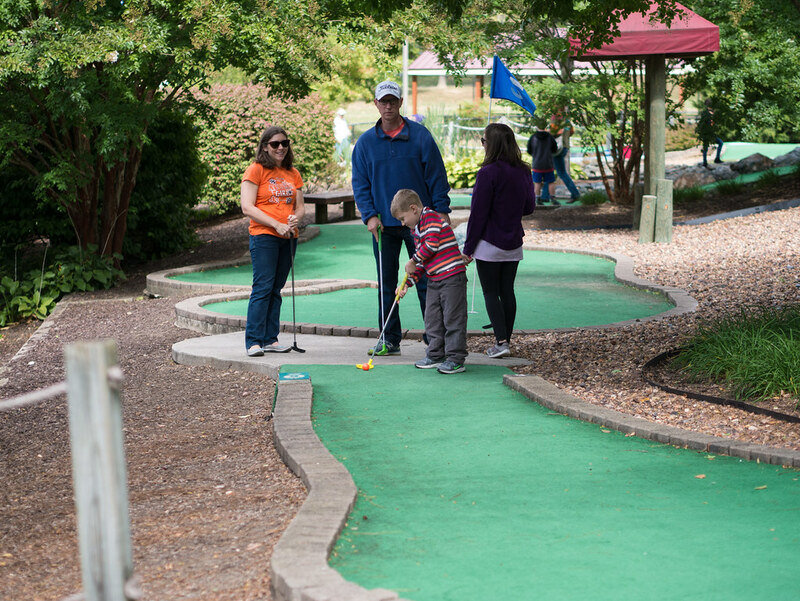 We split into two foursomes, with the girls requesting me to accompany them while JJ and the other adults made up the other foursome. 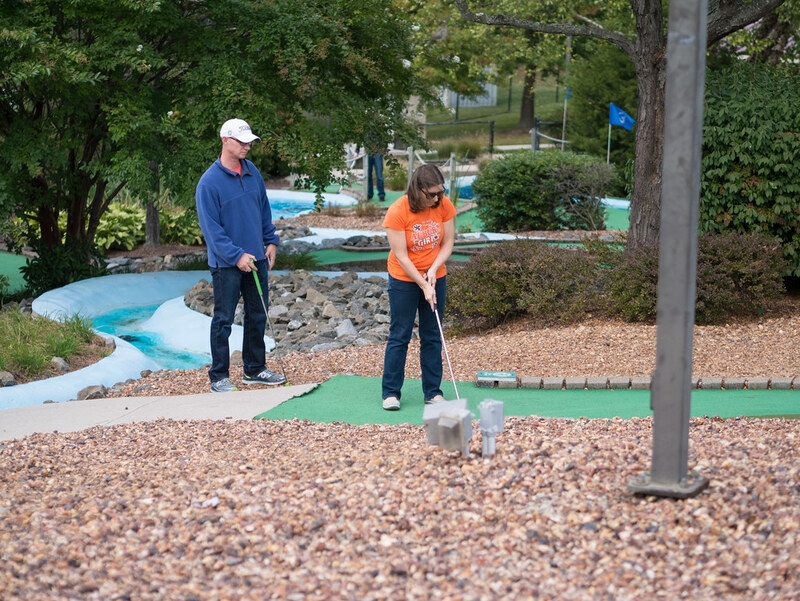 There was some intense concentration. 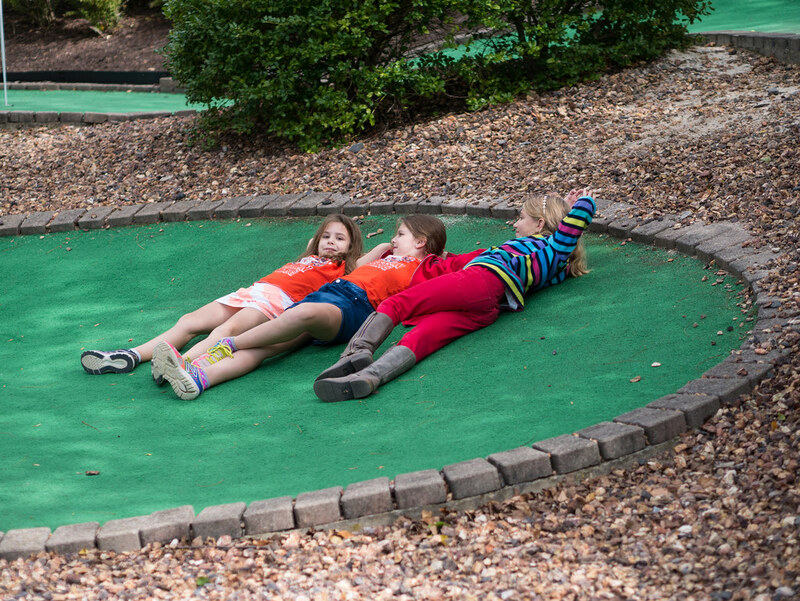 The girls had fun golfing, but also got a bit of time to relax while waiting on the other group to catch up. 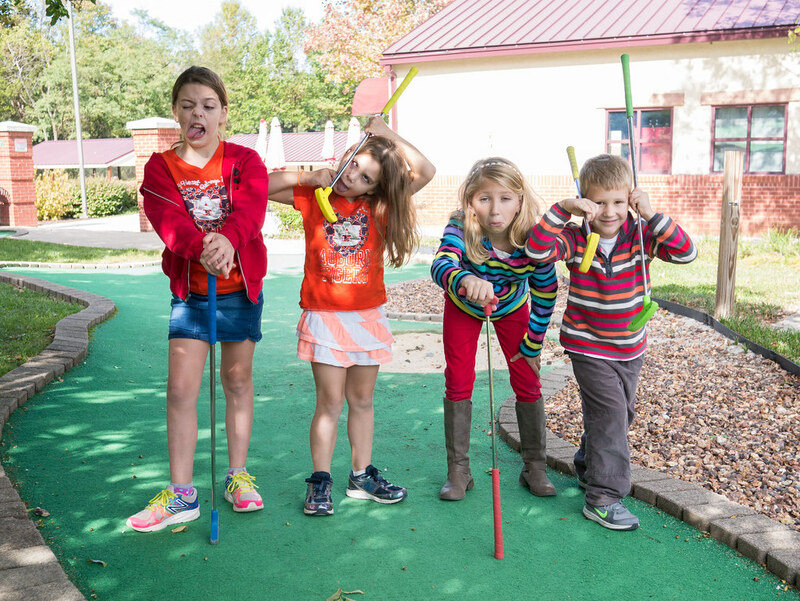 The putt-putt course is right next to Rita’s, so we had to stop in for a treat. The day after Leah’s actual birthday, she had her birthday party. 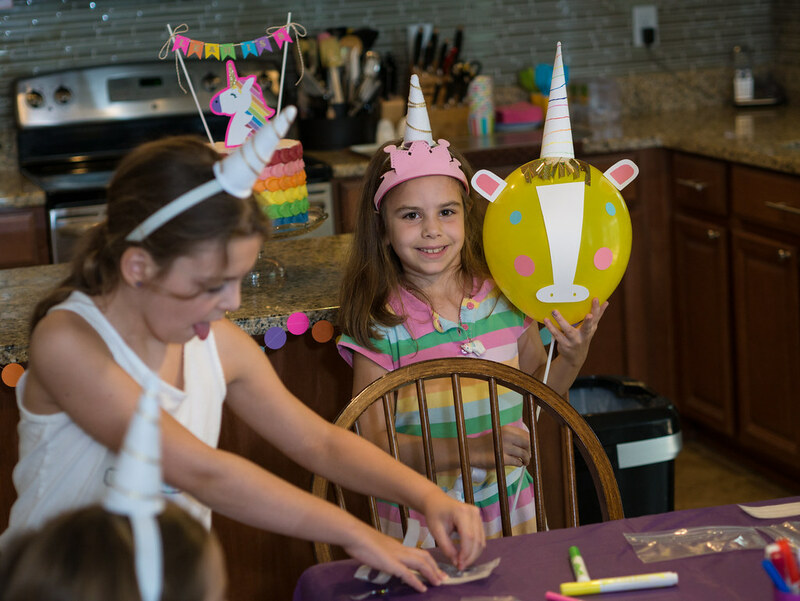 She had no doubts about the kind of party she wanted - a rainbow unicorn party. 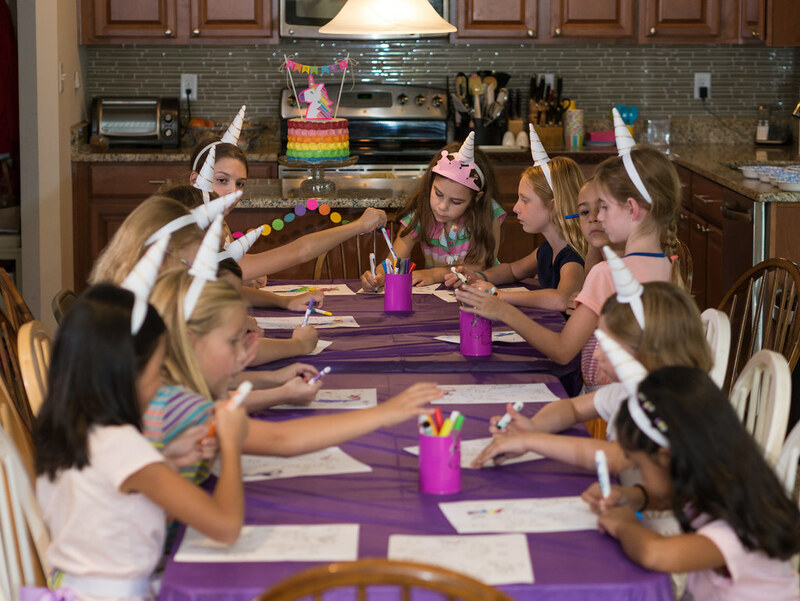 Yes, not just a unicorn party, but specifically a rainbow unicorn party. 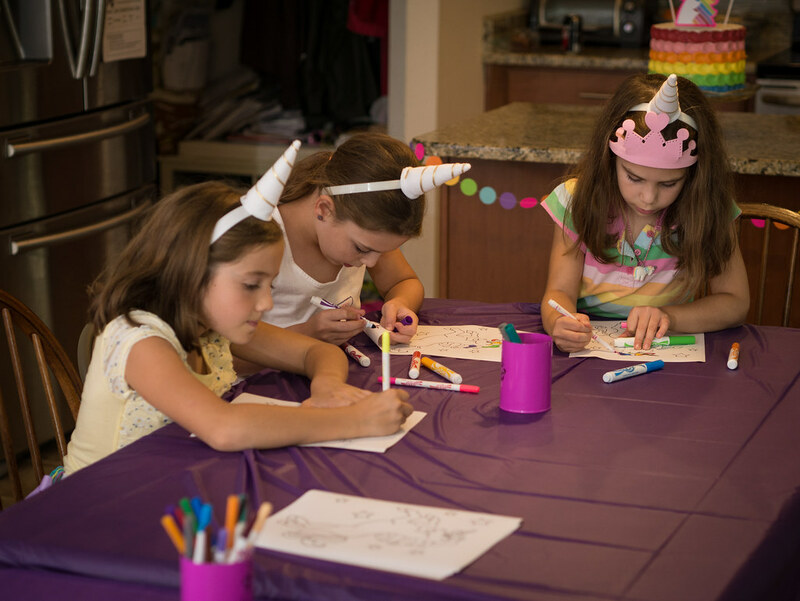 Throughout the summer, Leah typed up an outline brainstorming the details of her rainbow unicorn party. Yes, she is her mother’s child. Rainbow unicorn decorations were everywhere - even outside. 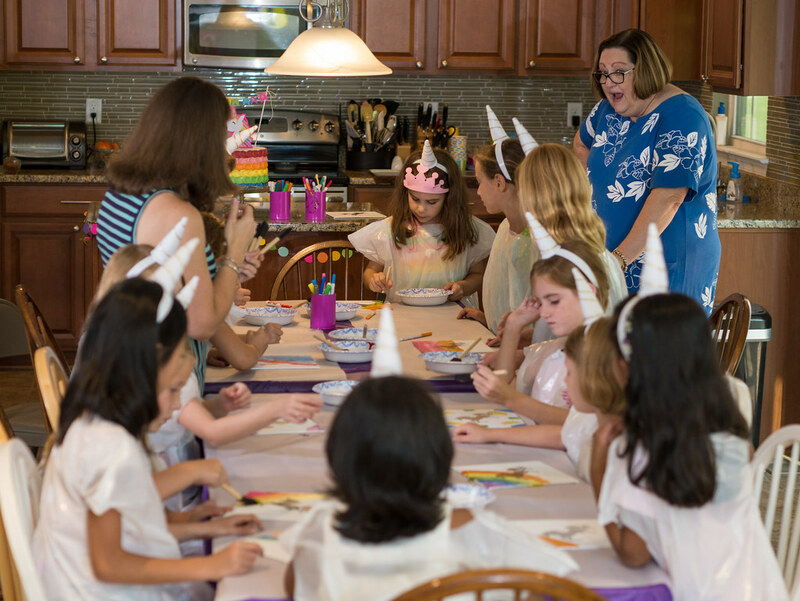 As guests arrived, they were given a unicorn horn and tail, then headed to the table to color a bit until everyone was there. 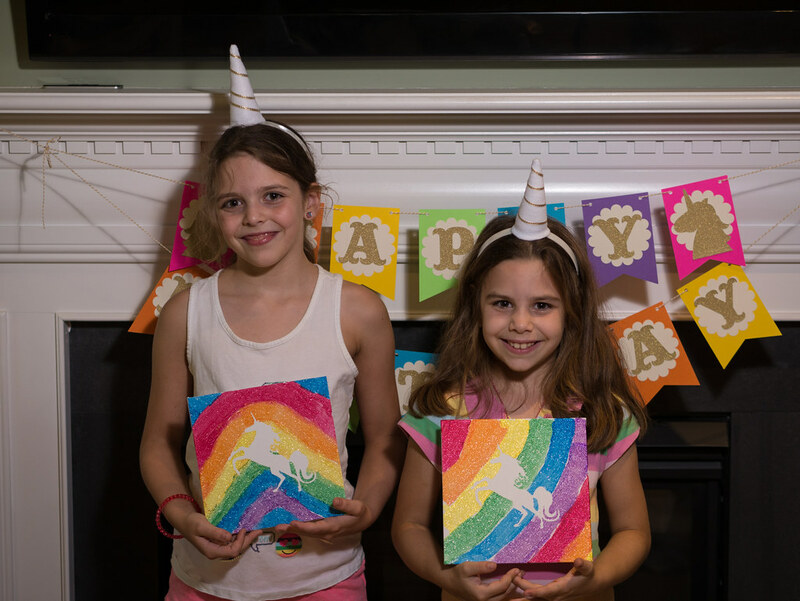 The girls then painted a canvas with rainbows. The canvas had a unicorn sticker, that was later removed after the paint dried. 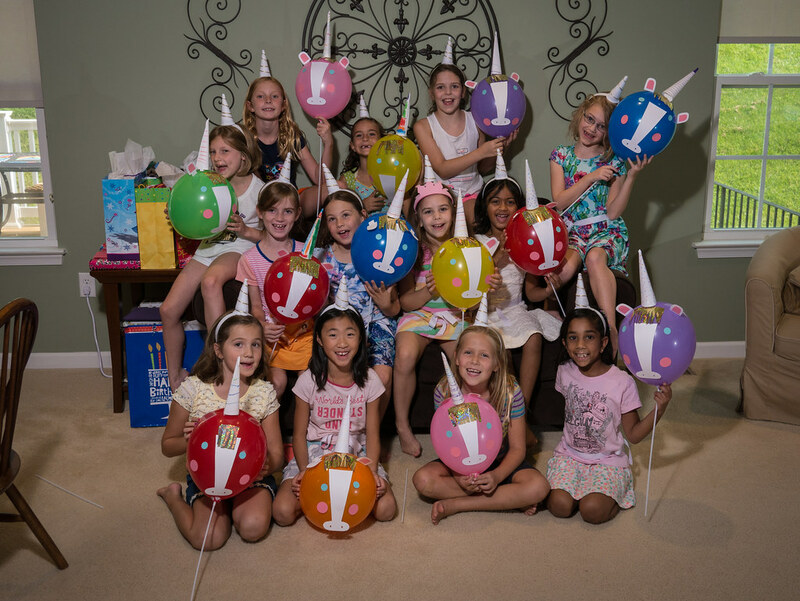 Here are the girls' rainbow masterpieces after the sticker had been peeled off (picture taken after the party). 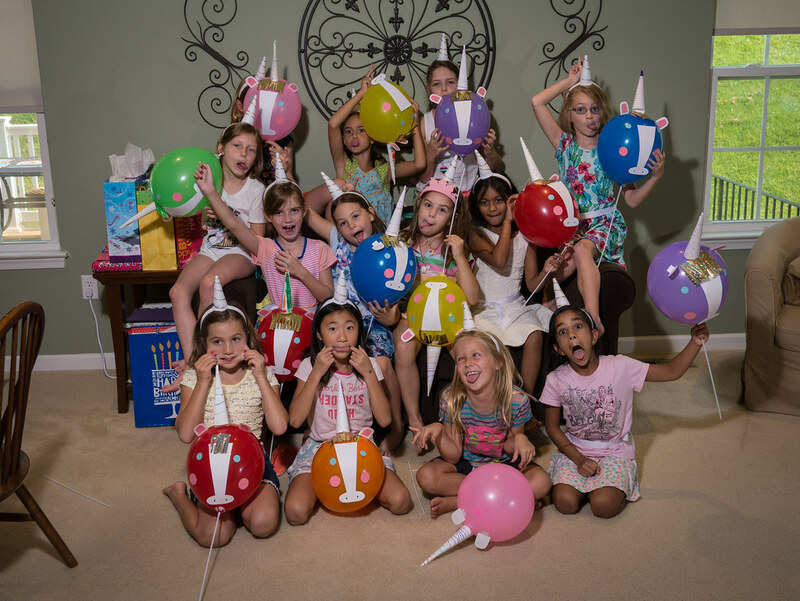 After painting, the girls all made unicorn balloons. 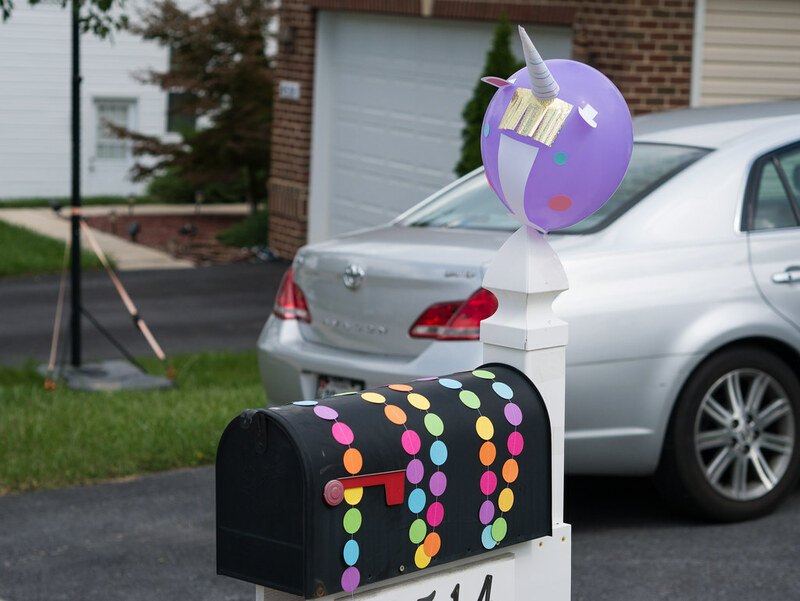 They picked a balloon, stuck everything on, and decorated the horn. 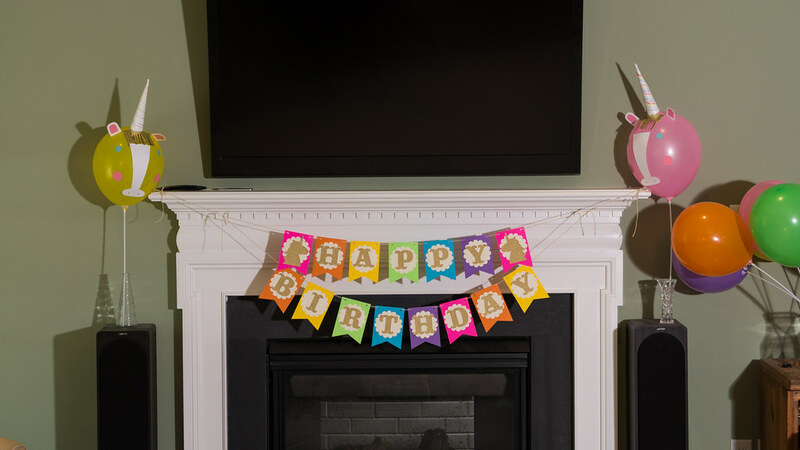 We had a little trouble sticking things on (glue dots didn’t work the way we’d hoped), but made it through. Leah clearly likes her creation. 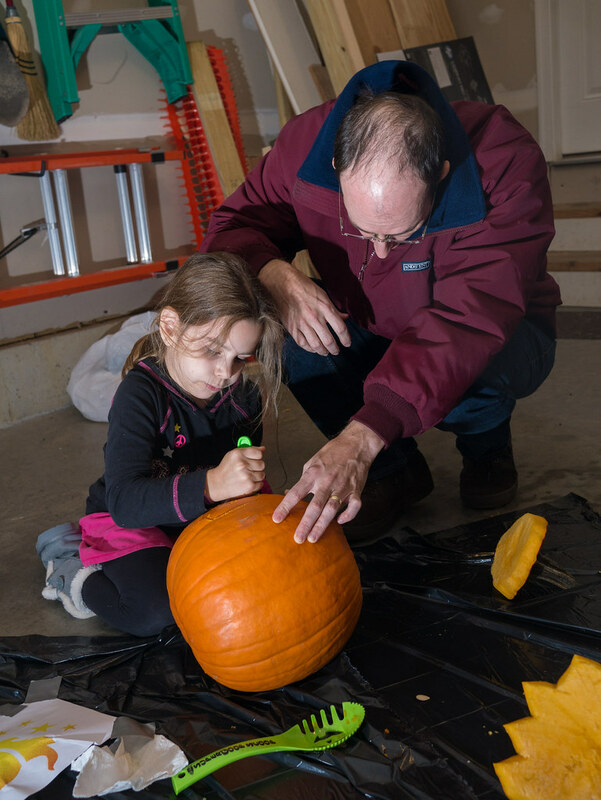 We had a couple of activities that were not on the original plan, including tail braiding. 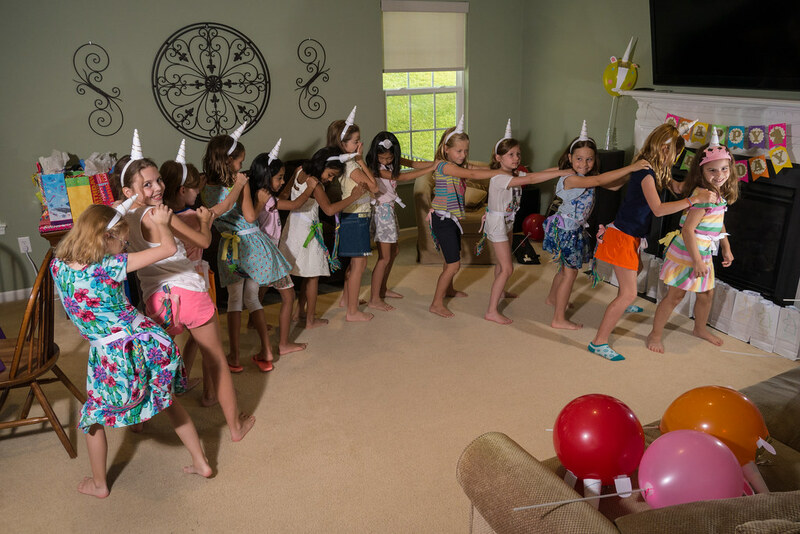 The girls had all been given unicorn tails when they arrived. 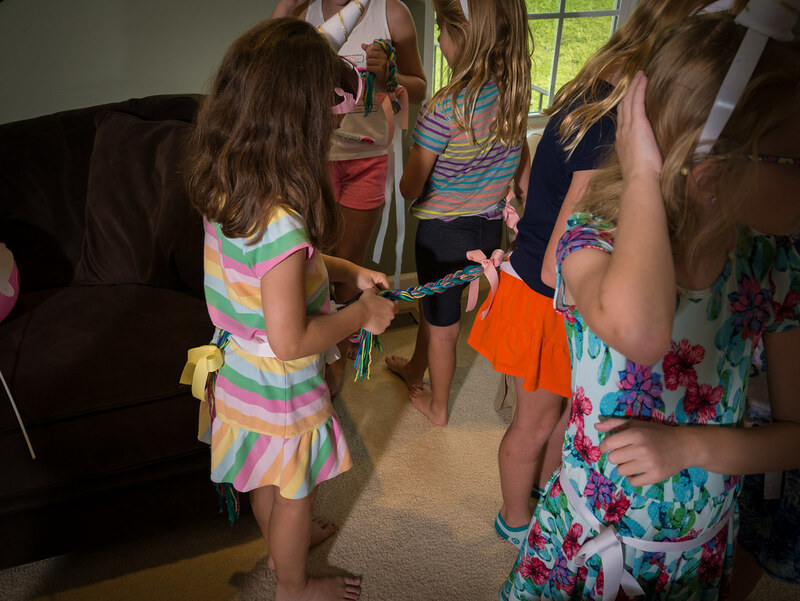 After the balloon craft, one of them decided to braid their friend’s tail, which led to everyone braiding each other’s tails. They loved it. 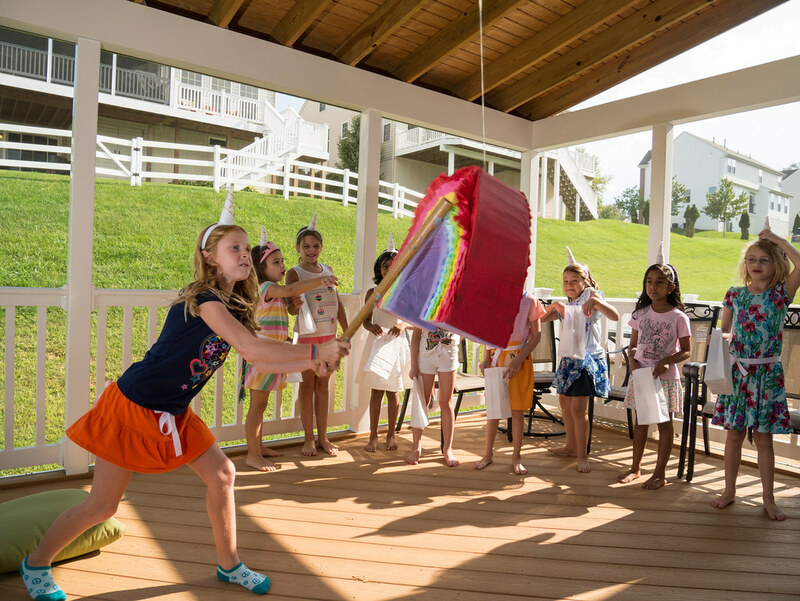 Another unscripted activity was the tail shaking dance party. They had the best time shaking their tails and dancing to the music. 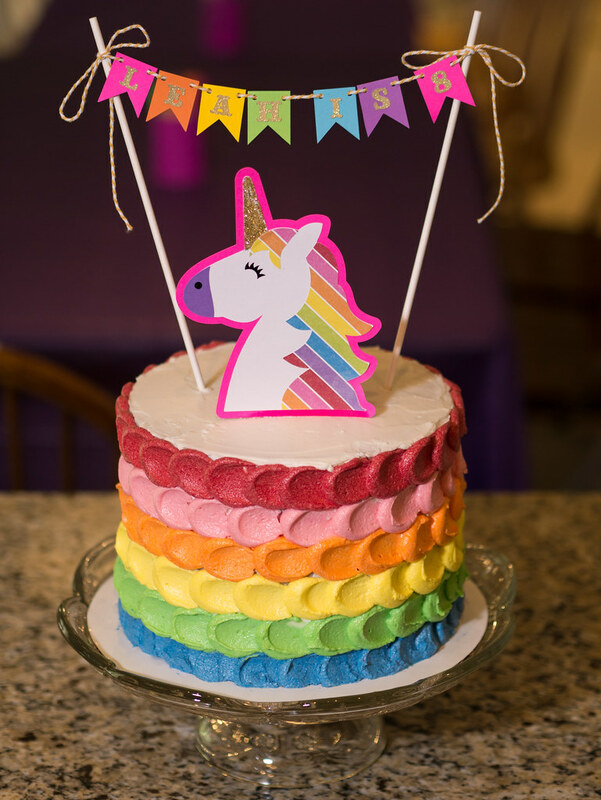 Jen made a fantastic 3-layer funfetti rainbow unicorn cake for Leah’s party. And we sang Happy Birthday (with a little extra unplanned fire). 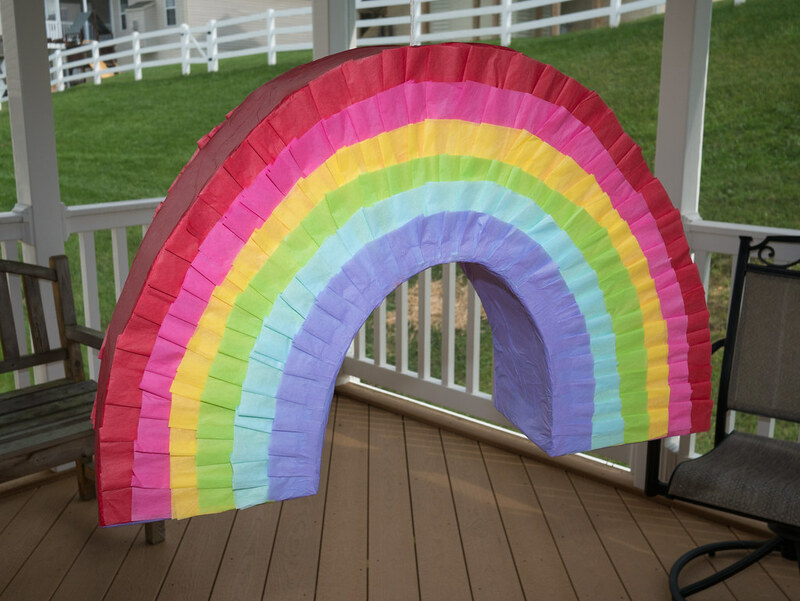 Jen also made a great rainbow piñata for the party. 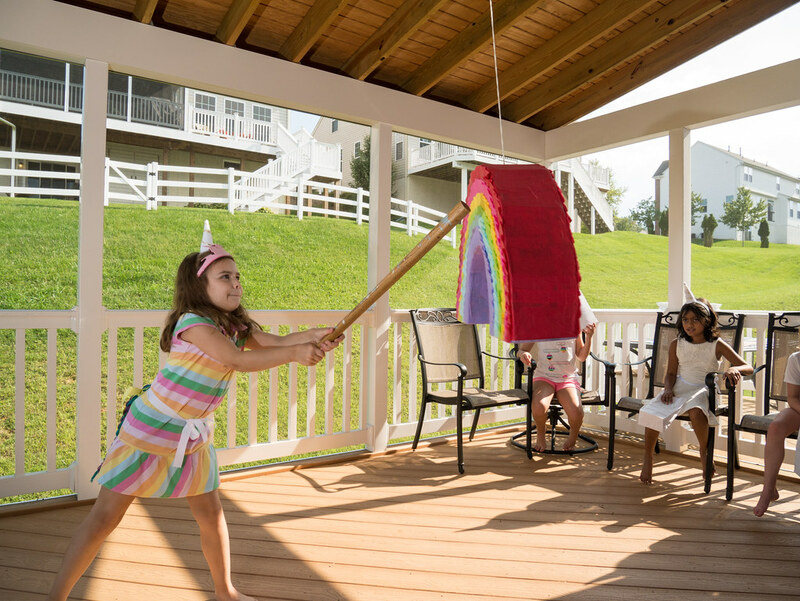 The girls all got to swing at it several times. 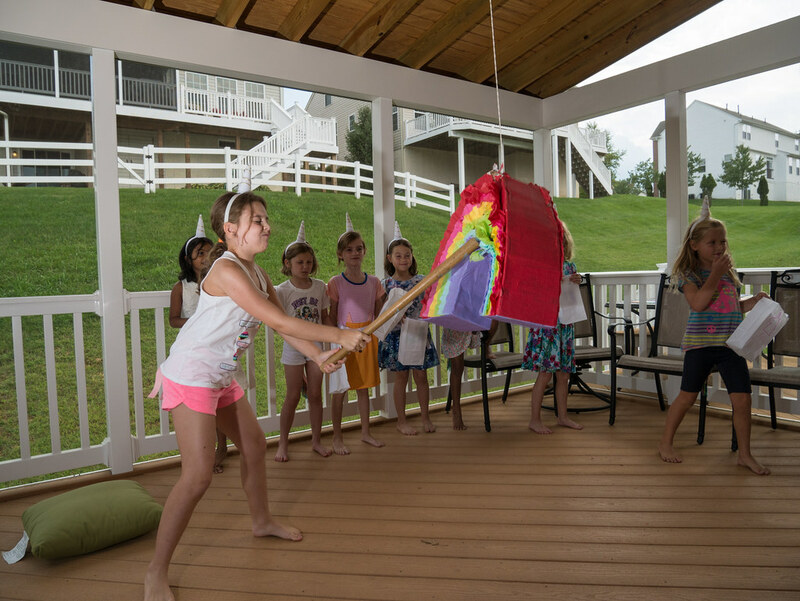 After several rounds, the piñata was defeating the girls. So, they called in a big strong hitter to take it down. Jen only needed one swing. The celebration continued on Leah’s actual birthday. 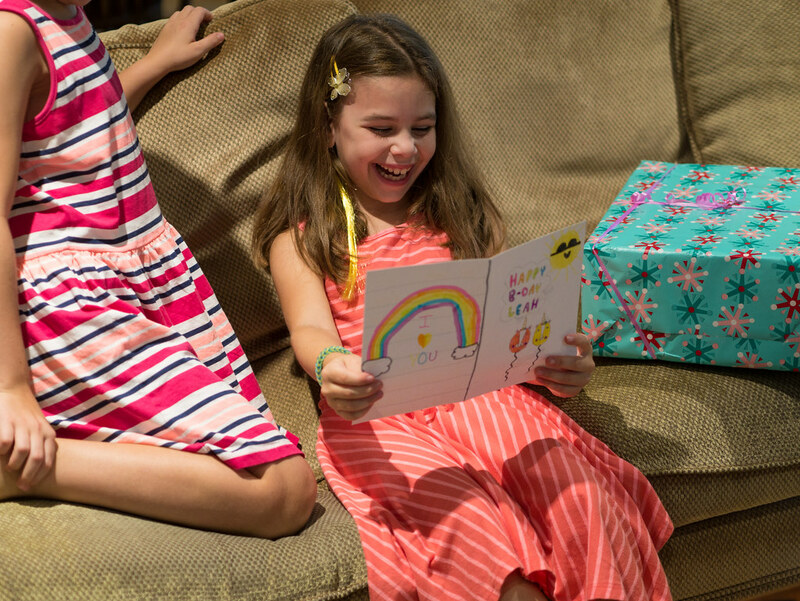 Leah shares a birthday with one of her best friends (Grace), and their birthday fell on a Saturday this year. 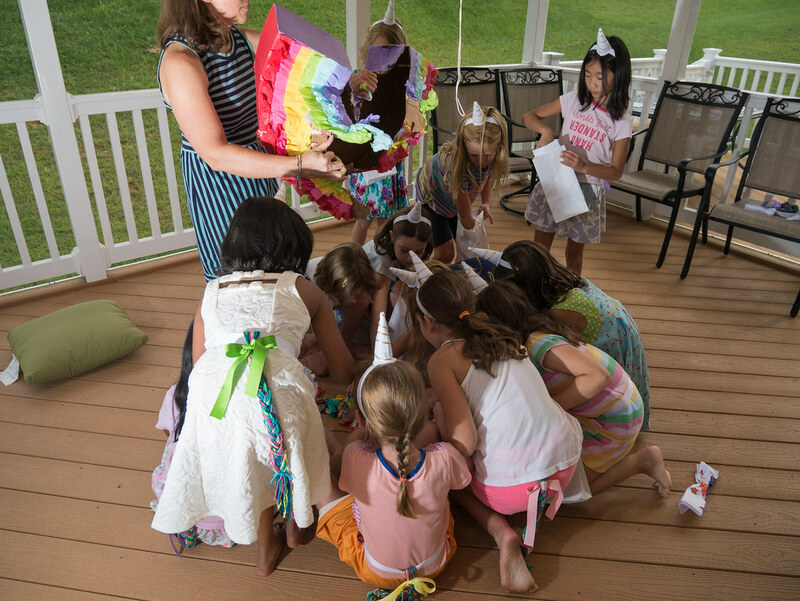 So, we made sure their parties wouldn’t conflict, and decided Grace would have her party on their actual birthday and Leah’s would be the next day. 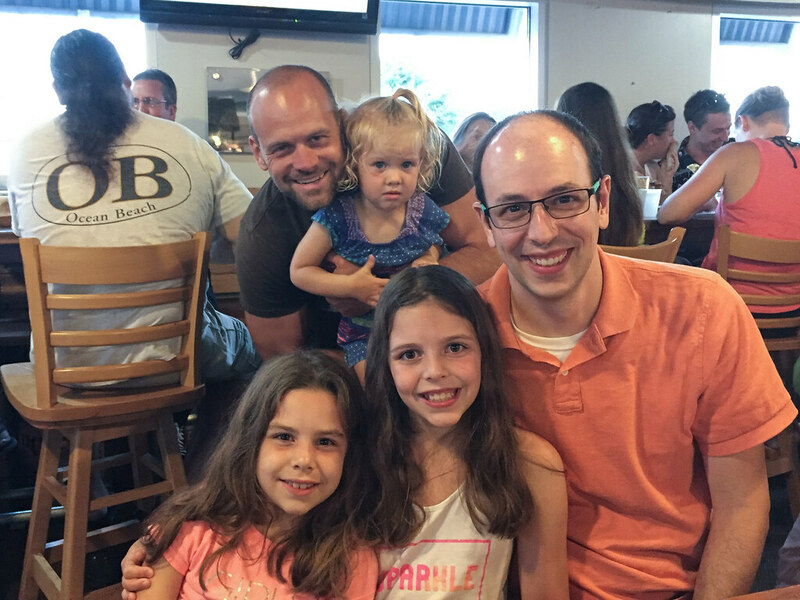 We decided to go out to lunch for a family birthday meal rather than dinner, and Leah surprised no one in choosing Ledo Pizza for our destination. 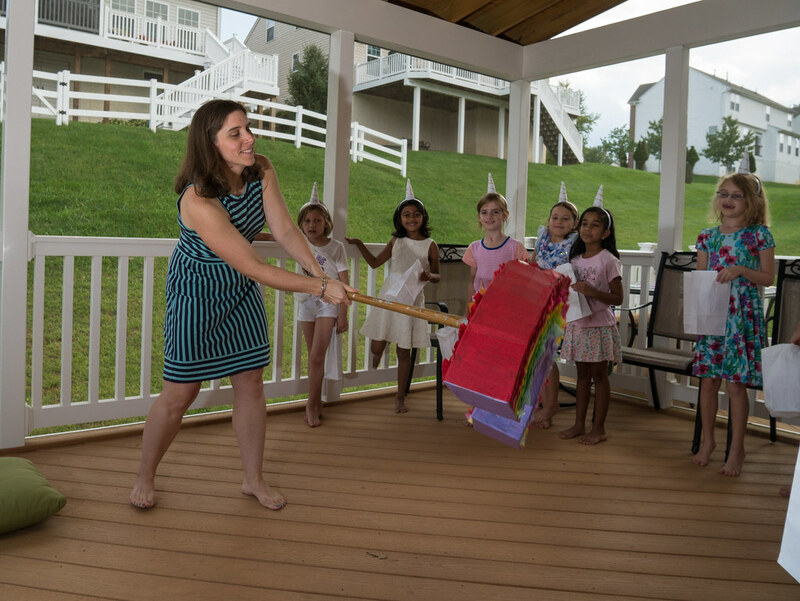 After lunch, there was no time for presents because Leah headed off to Grace’s American Girl tea party. 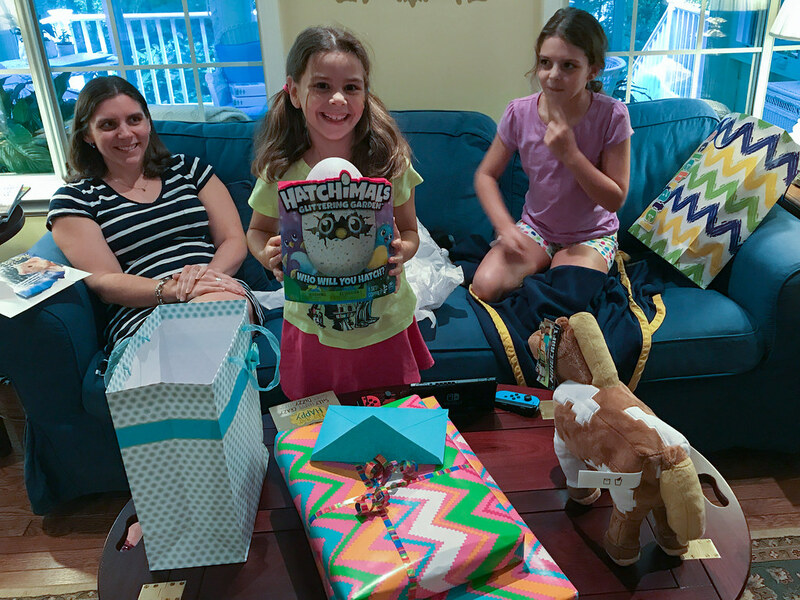 After she got home, she was eager to open them up. Molly made a great card for her. 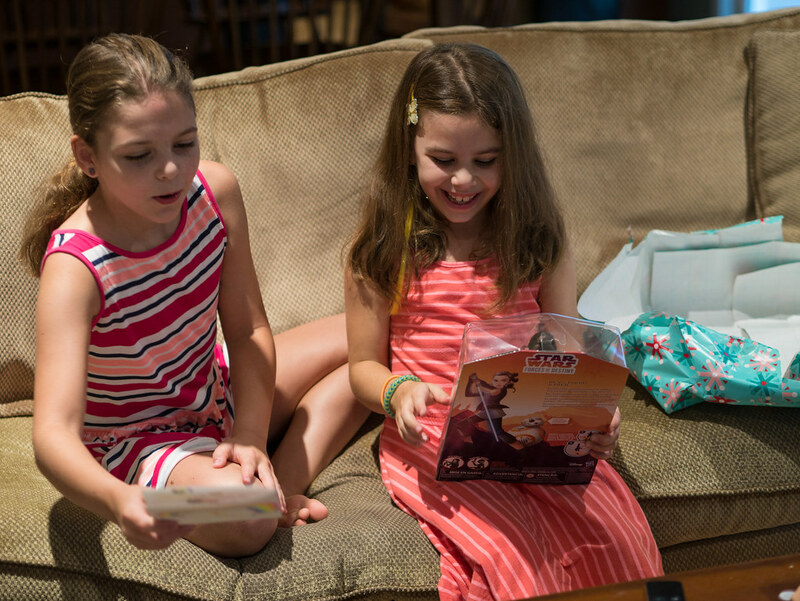 Star Wars is still a big hit, and the new Forces of Destiny toys are a favorite of our girls. 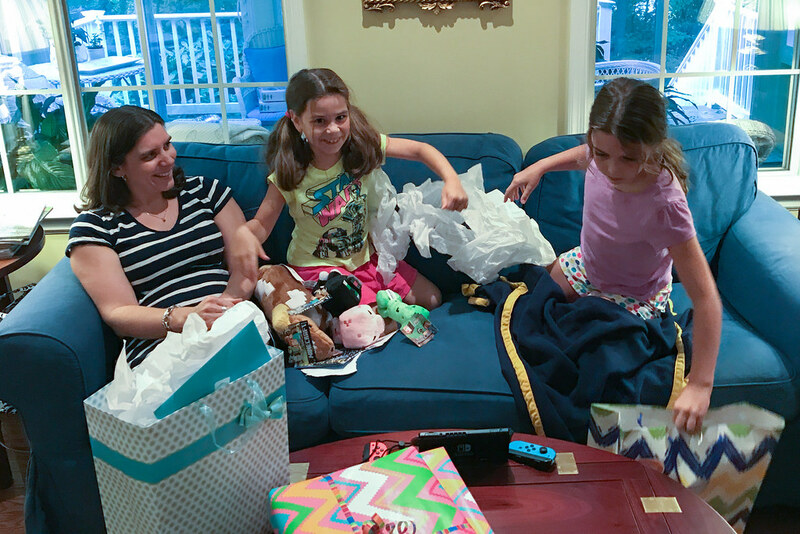 Molly already has Leia and R2-D2 (which she got in Disneyland), and now Leah has Rey and BB-8. Leah’s wanted Heelys for a long time, and was very excited to get them. Now she just needs to figure out how to skate in them. 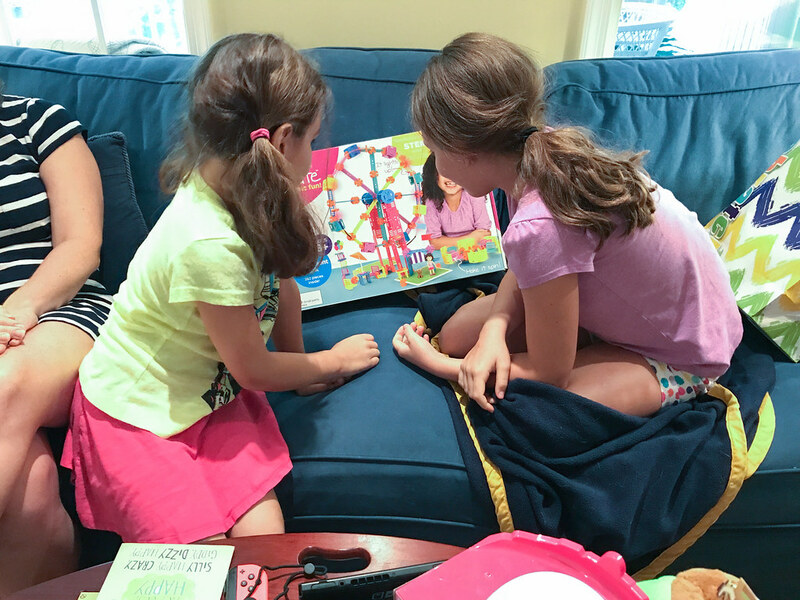 The girls really enjoyed playing with a marble run toy that was at the beach house in California, so we gave Leah one for her birthday. 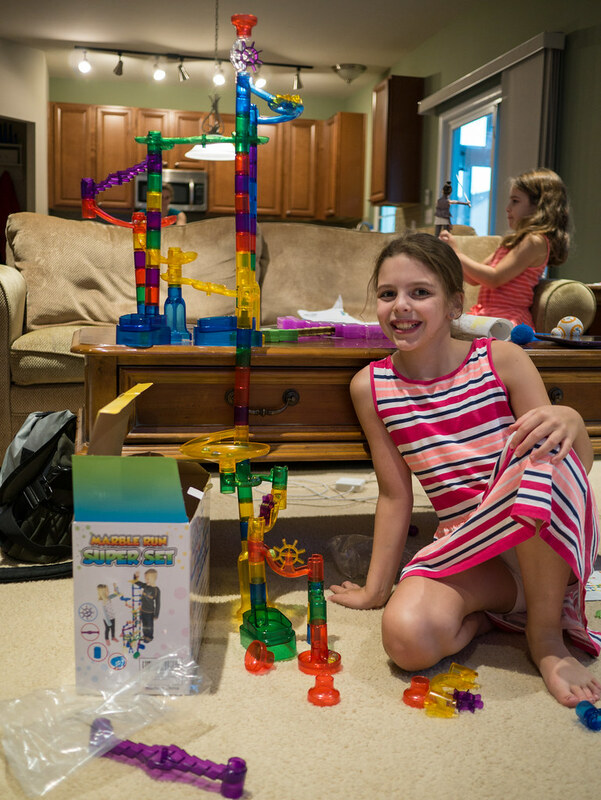 While Leah was enjoying her other new toys (that’s Rey in her hands there), Molly was quick to open up the marble run and construct a fun run. 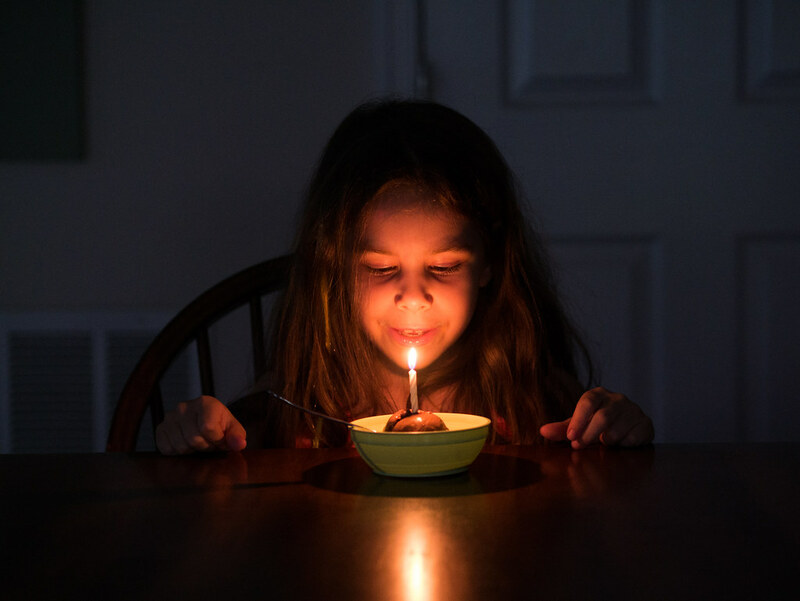 After dinner, Leah got to blow out a candle. The cake had to wait for her party the next day, but no one complained about the homemade chocolate ice cream Jen made for us. 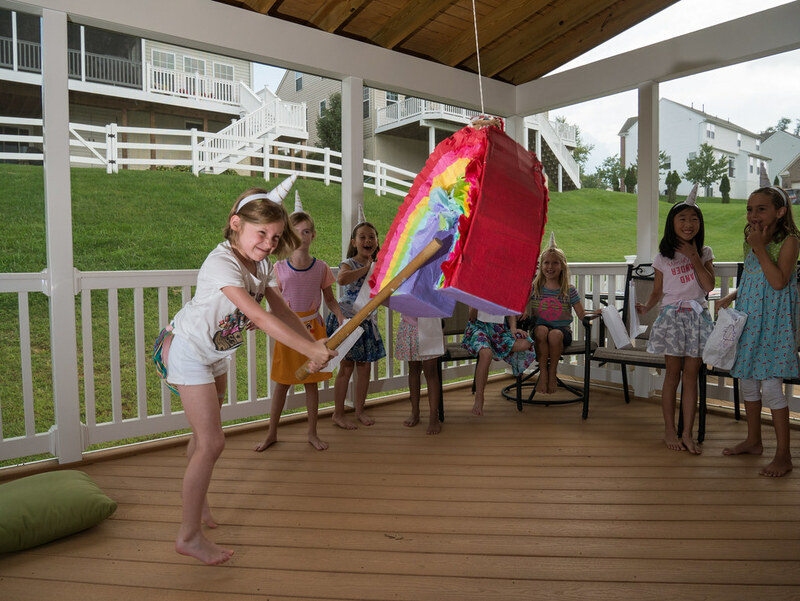 Shortly after school started, it was time to celebrate Leah’s 8th birthday. This started a week early at Grams’s house. There were of course presents. 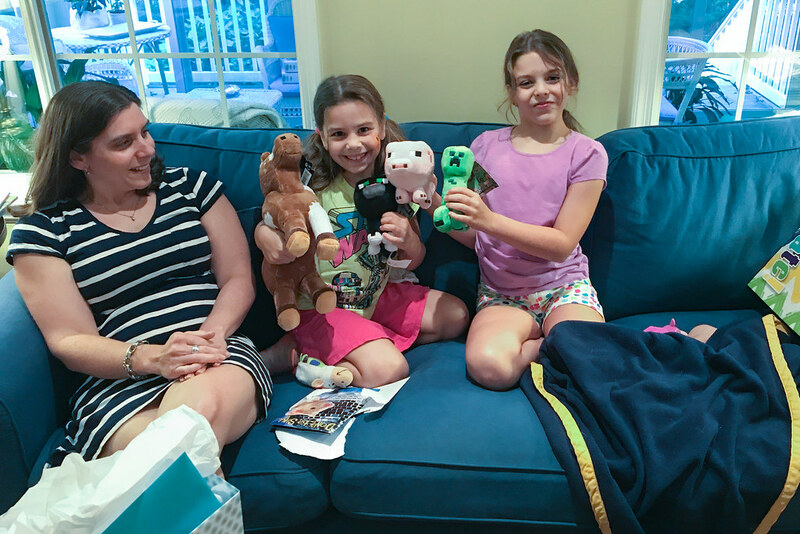 These perfect presents combined two loves of Leah - Minecraft and plush toys. Good things come to those who wait. Hatchimals were impossible to find at Christmas, but now Leah’s got one of her own. Minecraft, Lego, Roominate. Do you get the idea that she likes to build? 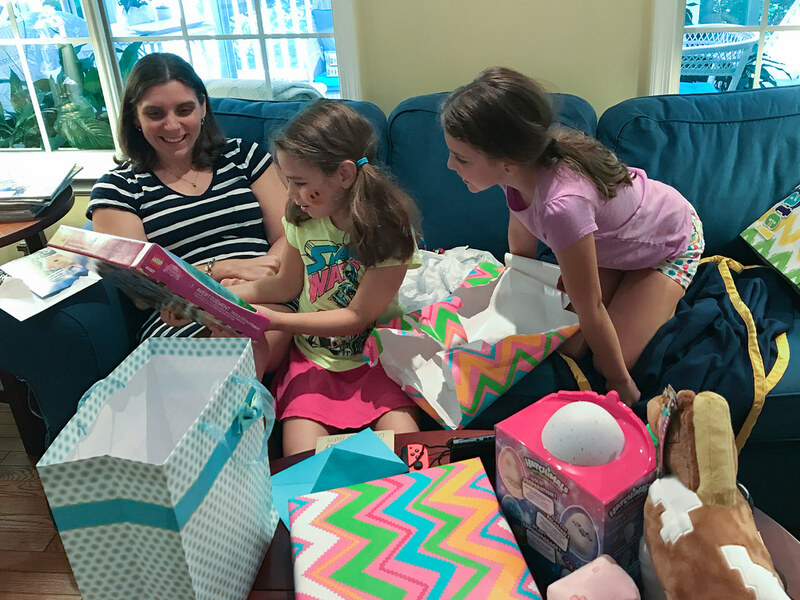 Thanks to all for the presents and the fun celebrating early. 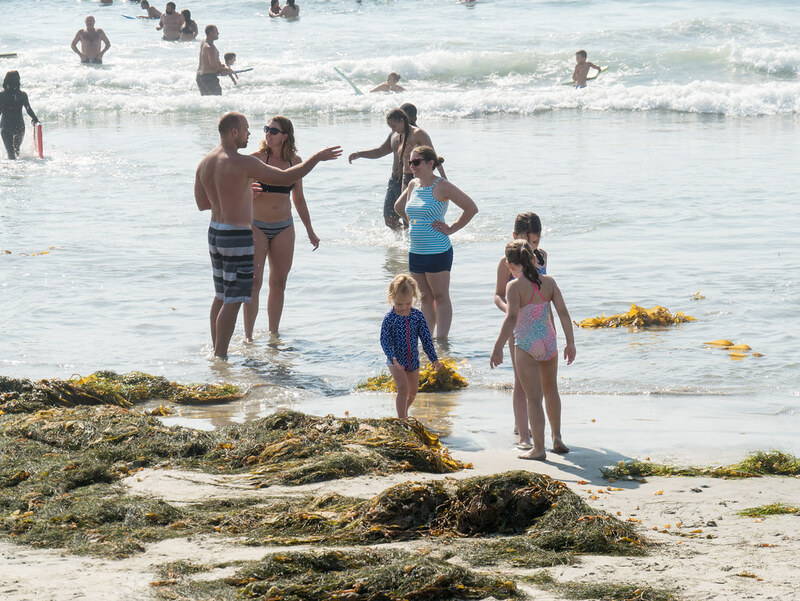 After spending Friday at the beach, it was time to leave L.A. However, rather than head back east, we chose to head south to see an old friend. Bill’s my best friend from high school, and he now lives (with his wife, Lauren, and daughter, Sloan) in San Diego. So, we though we could spend an extra day in California to see him. 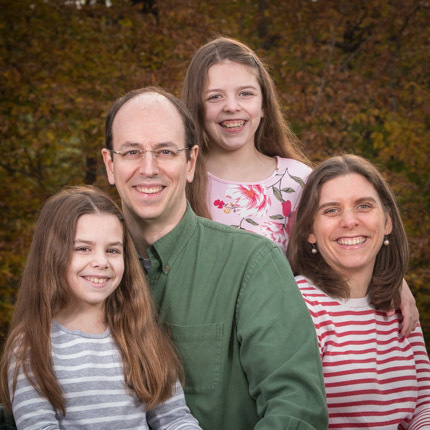 This was tough, as the girls started school that week and Bill’s family was flying in from Hawaii Friday, but we were determined to make it work. We planned to leave very early Saturday morning, hoping to get to San Diego in time to go to the zoo around when it opened. Sadly, Molly didn’t feel well before we even got in the car. She felt sick the whole way, and we had 4 vomit stops along the way. Given how hot it was, we decided taking her to the zoo was a bad plan. Instead, we headed to Bill’s house to hang out and let her rest. Amazingly, after we arrived and she got some time out of the car, she was fine. We hung out at their house for a bit, and got to meet Sloan. Since Molly was doing better, we decided she could handle going out and doing something. 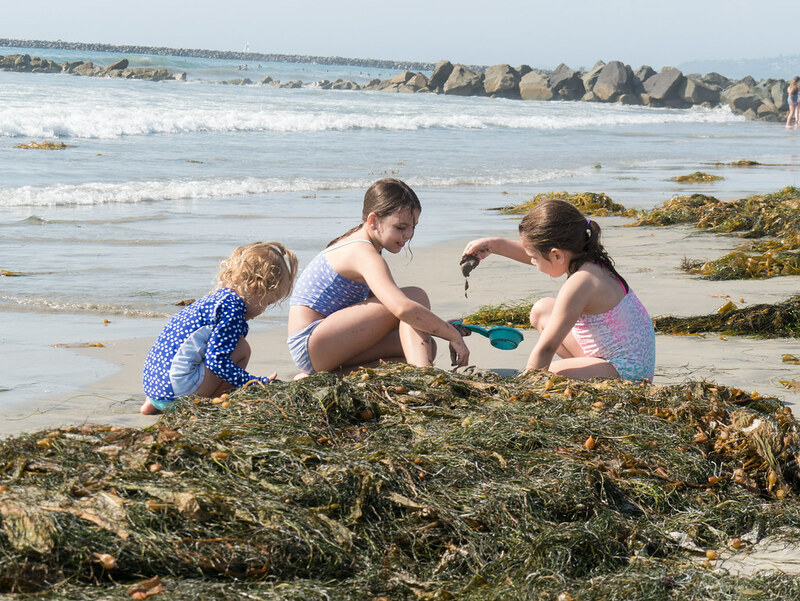 They live right off the beach, and the girls were begging to go back to the beach, so that’s what we did. We figured if Molly relapsed, at least it wasn’t far to get back. She didn’t though, and we had a lot of fun at the beach. The girls enjoyed playing with Sloan. 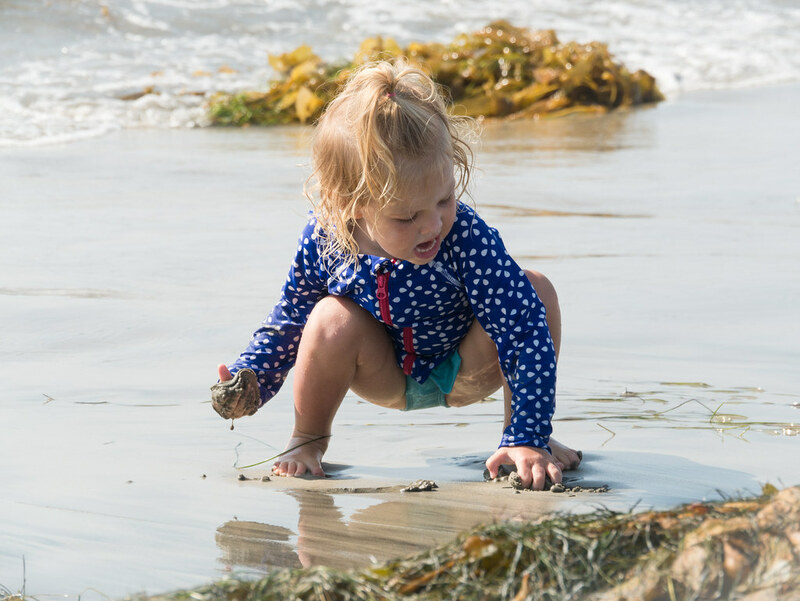 They may be much older than her, but Sloan has much more beach experience than them, making her the beach expert of the bunch. 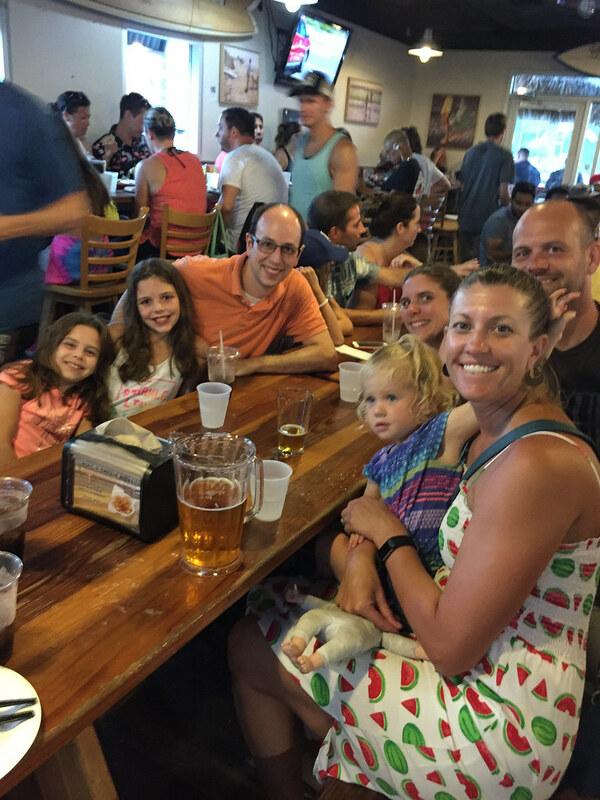 After the beach, we got cleaned up and headed to a local pizza place (which our girls were really pushing for). We had intended to get a hotel room that night. Since hotels in San Diego are expensive, I’d been trying to grab a deal last minute on Hotwire. But Bill and Lauren were very kind and offered for us to stay with them instead, despite the fact that they’d just gotten back in town the night before. Bill and I even got to go on an early morning run together for the first time since high school cross country. Then we got ready and headed to the airport, ready to get home Sunday night after a long but very fun trip. 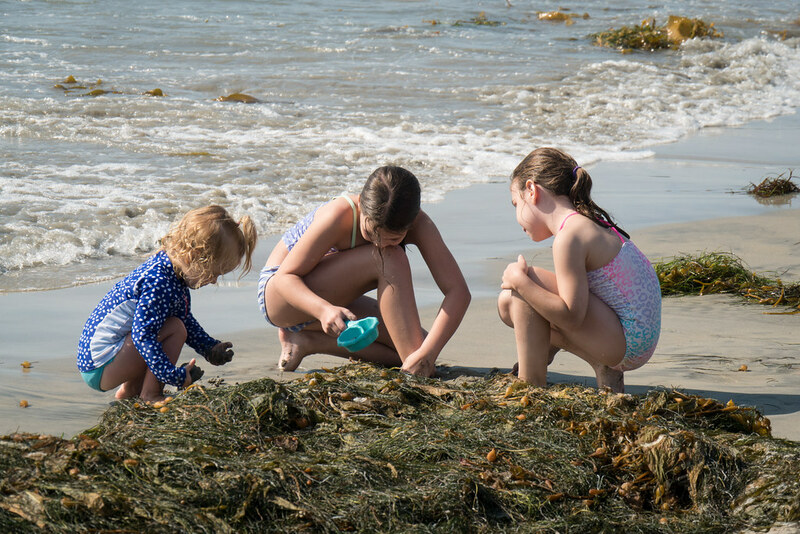 The girls at least got the next day (Labor Day) off before starting school on Tuesday. The timezone change right before starting school wasn’t ideal, but we managed. 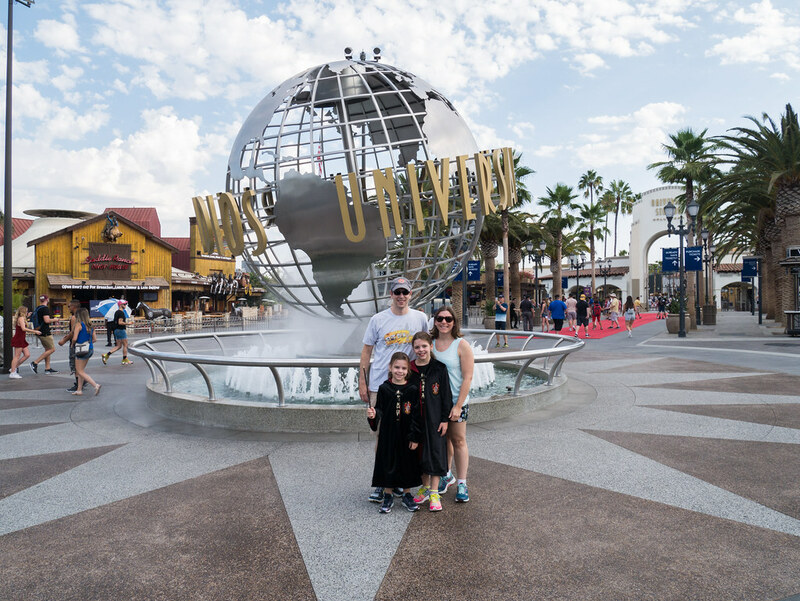 OK, I guess this post should be titled Universal Studios Hollywood as we did explore the whole park, but honestly, the part we were really excited about was The Wizarding World of Harry Potter. Thursday we skipped the beach and drove to Hollywood to go to Universal Studios (and Molly again got carsick on the drive there). 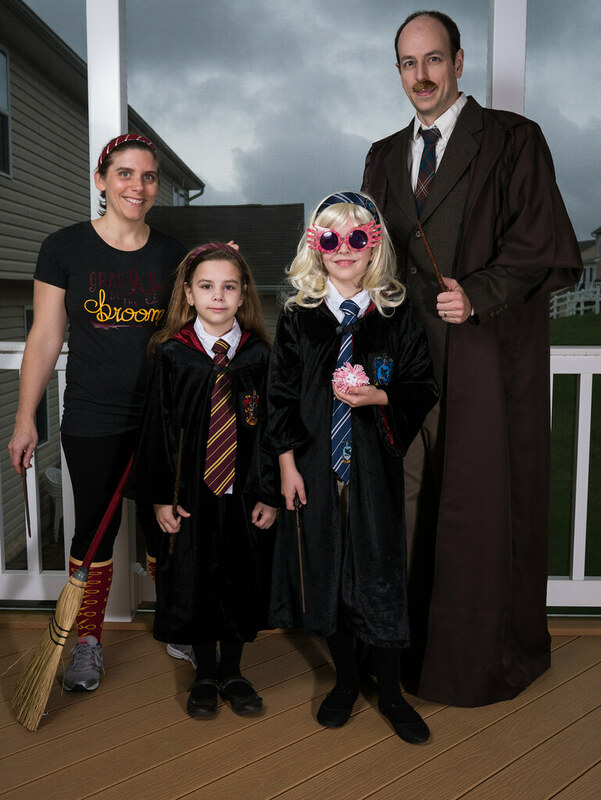 The girls were decked out in their Gryffindor robes and Harry Potter shirts that Jen made them (and I’ve got a Harry Potter shirt as well). 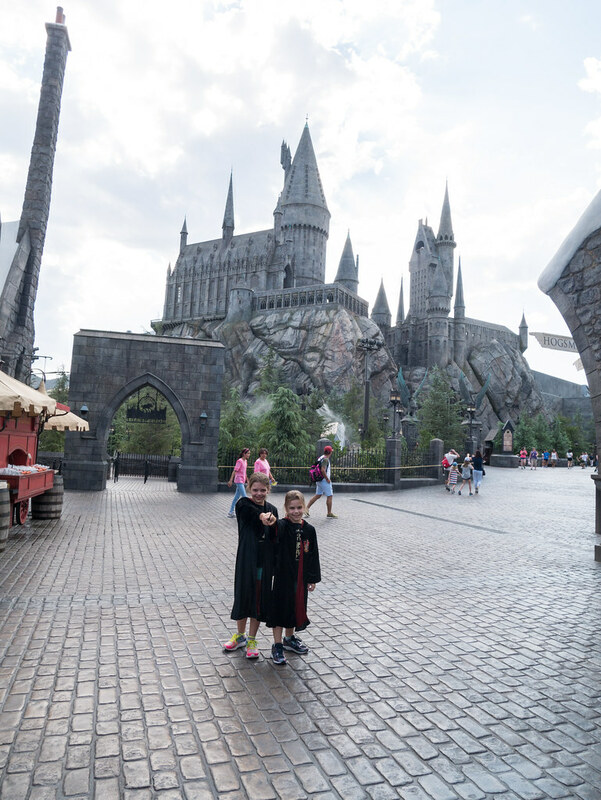 We got to the park when it opened and headed straight to Hogsmeade. 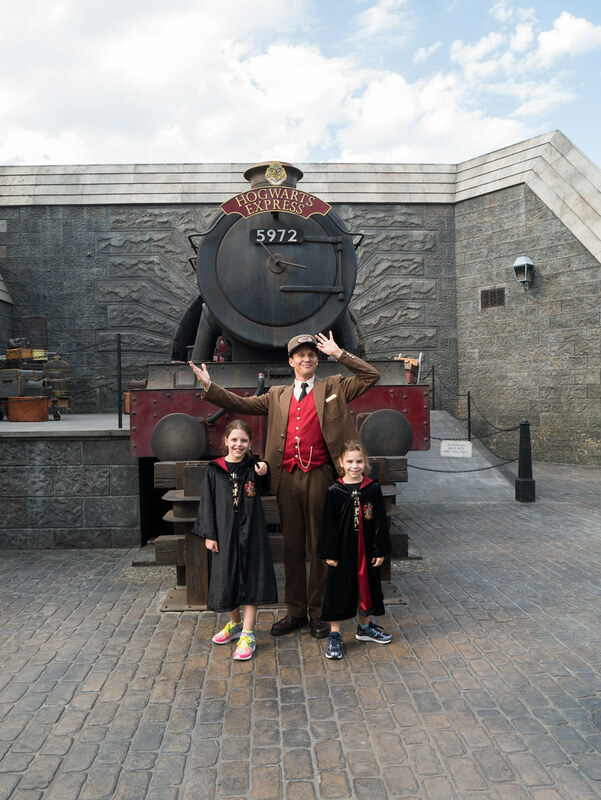 As there weren’t many people there yet, the conductor of the Hogwarts Express motioned our girls over to talk about the train and take a picture. We then got in line for the wand choosing experience at Olivander’s. It was really cool. 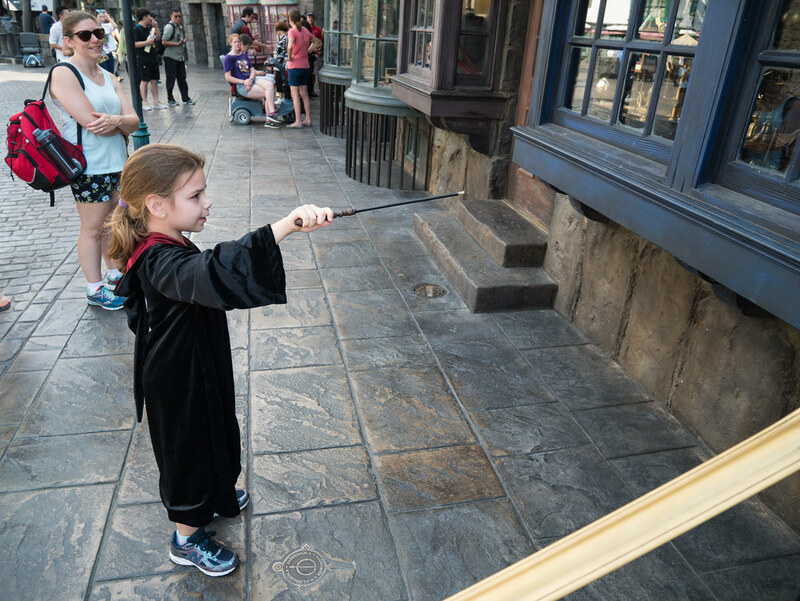 They pick one child from each group and replicate the wand choosing experience (like in the Sorcerer’s Stone). Sadly the wandkeeper did not choose one of our children, but the show was still really cool. After the experience, you go into Olivander’s where you can purchase a wand. 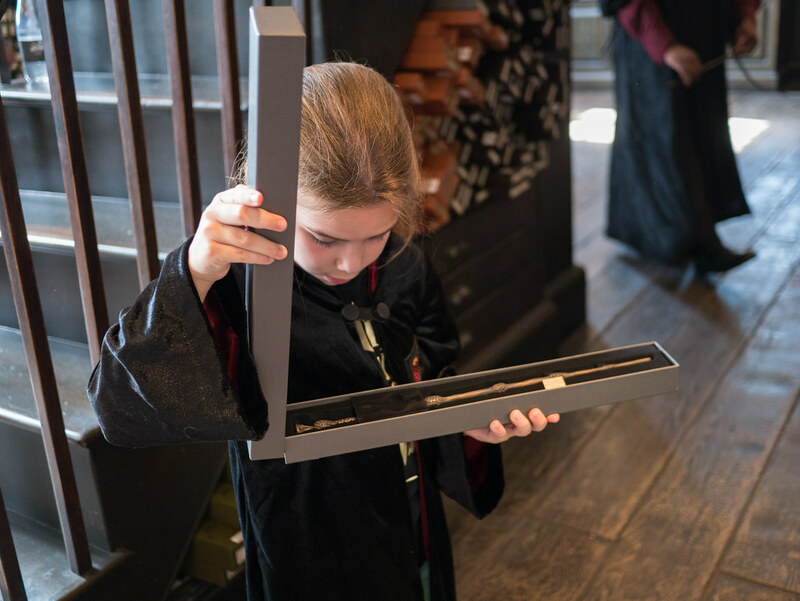 We opted to wait to do so, but had fun looking at all the wands (can you identify the wand Leah is looking at?). Harry Potter world is so fantastic. 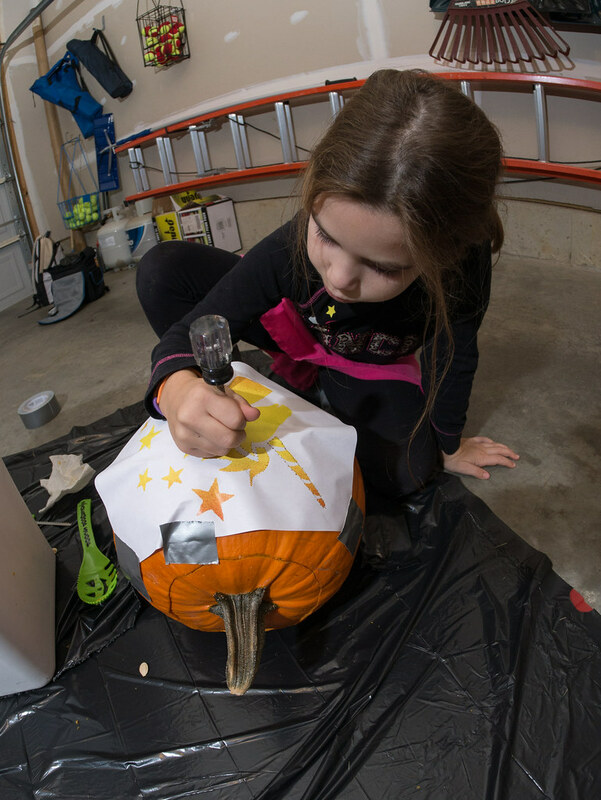 Part of the fun is using a special wand (you can buy them there, but we already had one that we borrowed from Aunt EA and Uncle Scott) to make magic. 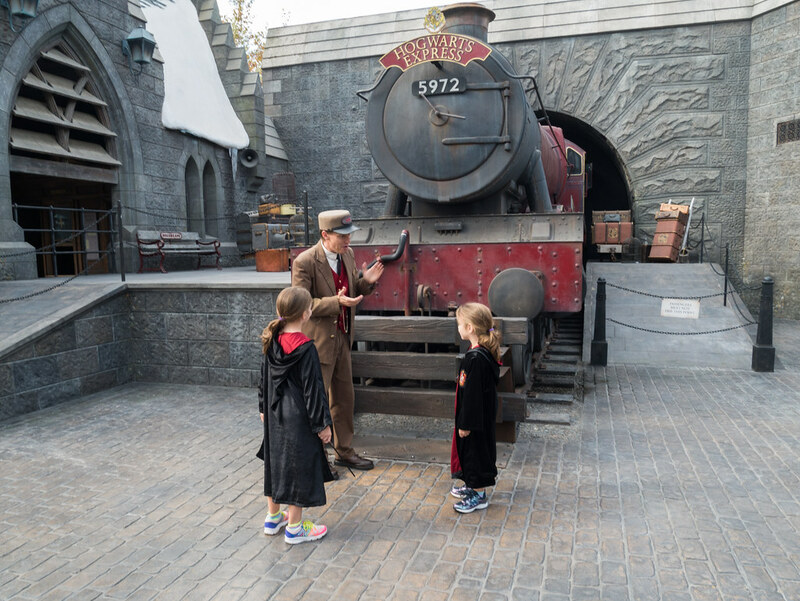 Three are lots of places around Hogsmeade that have spells for you to do. If you say the magic words and move your wand in the proper motion (which is actually quite hard to do), things will happen. Here Molly was making some Quidditch balls fly around. Leah managed to unlock the magic hidden inside this window with Alohomora. We did this a lot all over Hogsmeade, and it never got old. They had a lovely a cappella performance of Harry Potter songs (some from the movies, some new) by these students and their toads. We rode the Flight of the Hippogriff a couple times. 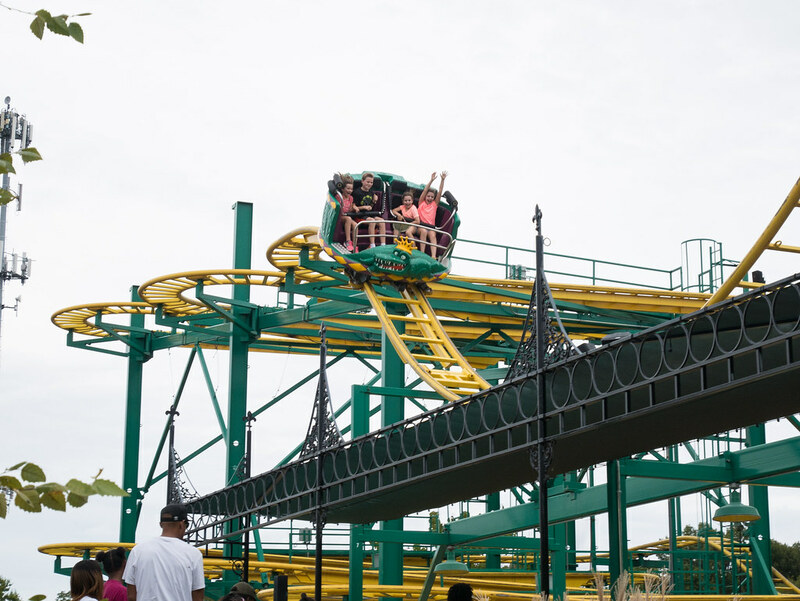 It’s a small, family-friendly roller coaster, but it’s still a lot of fun. And there was hardly any line. The most impressive ride in Harry Potter world was Harry Potter and the Forbidden Journey. It’s a hybrid ride - part simulator, part practical. Your seats are moved around by by a giant arm, sometimes with screens simulating flying on a broom, sometimes being surprised by giant dementors. It’s a lot of fun. And even better, the line goes through Hogwarts castle, making it the most fun I’ve ever had in a line. I rank this as definitely the best ride at Universal. The morning was nice, but as it approached noon, it started to get really hot. So, we got a couple Butterbeers. Molly has the soda variety (similar to cream soda) while Jen has the frozen version. Both were delicious. 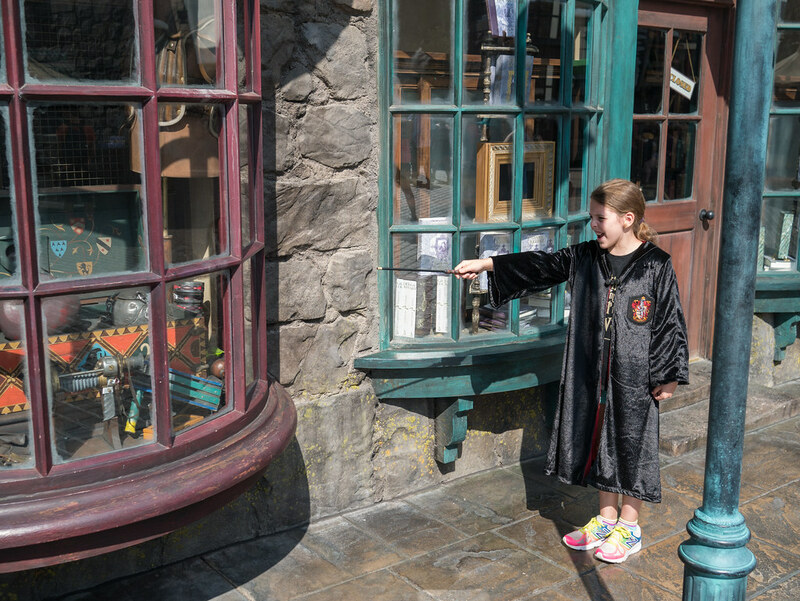 We explored some of the shops in Hogsmeade, all made to be like those in the films. 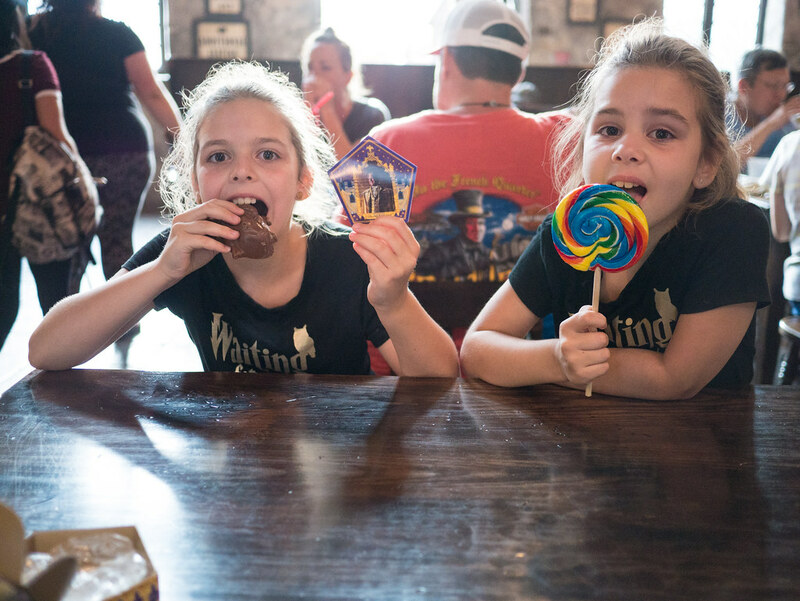 One of the best was Honeydukes, where the girls were very excited about the chocolate frogs. We didn’t get anything at that point, though we came back later for some treats. We then left Hogsmeade to check out the other parts of Universal Studios. Unfortunately, it started to really get hot (like around 100 degrees hot), which made walking around and standing in line outside tough. We went to the Special Effects Show, which was fun and indoors, where we learned about how they do different special effects in movies. 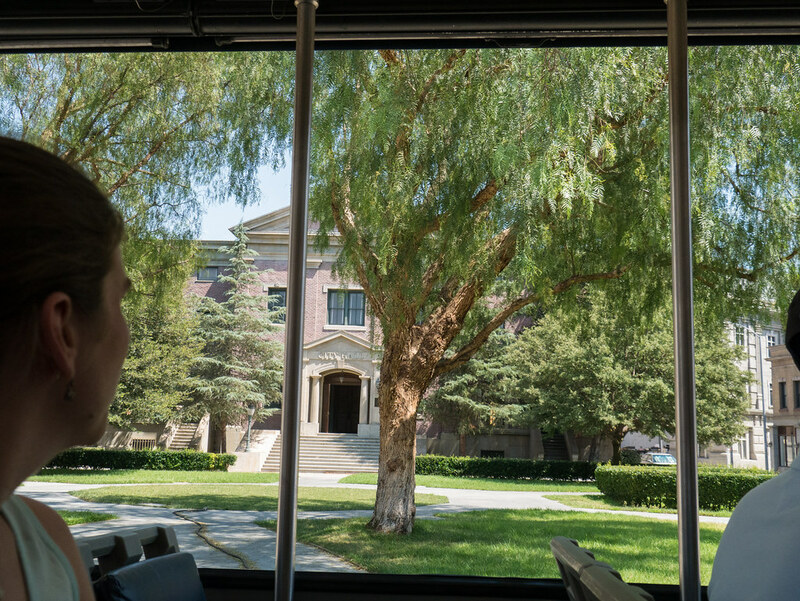 Then we went on the studio tour, which rides through many of the places Universal shoots movies and TV shows. Here’s a city hall, notably used in Back to the Future. 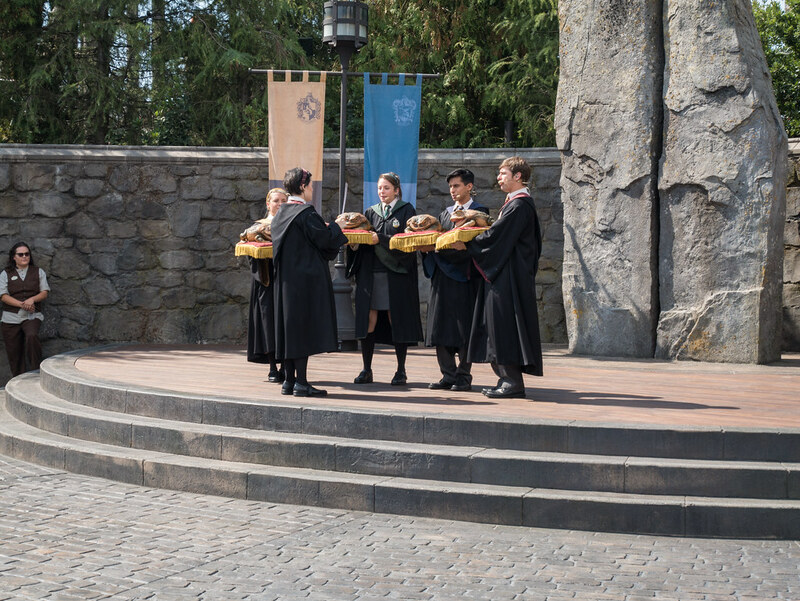 The studio tour was more than an hour long. It included lots of the individual attractions that are separate in Orlando (Jaws, Fast & Furious, King Kong, Earthquake, and more). It was somewhat fun, but again, it was hot and we would have skipped lots of the parts of it if we could have. We wandered around a bit looking at rides but deciding their lines weren’t worth the wait in the heat. We tried to get the girls to go on the Jurassic Park ride to cool off, but they clearly had the water turned up due to the heat, so everyone got off completely drenched. None of us was looking forward to that, so we skipped it. 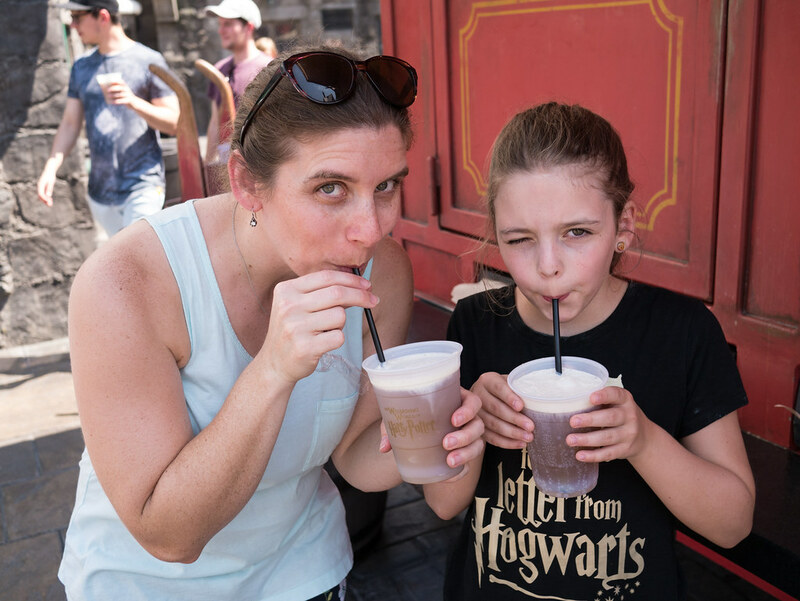 We tried and failed to get ice cream a couple places, and decided to head back to Hogsmeade instead for a treat. 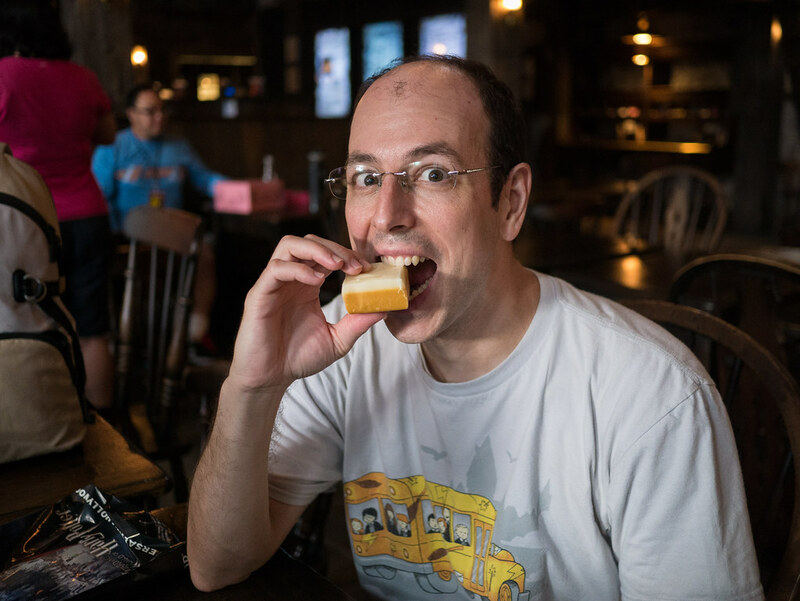 We bought those treats at Honeydukes, then found a table in the Three Broomsticks (which is air conditioned) to eat them. 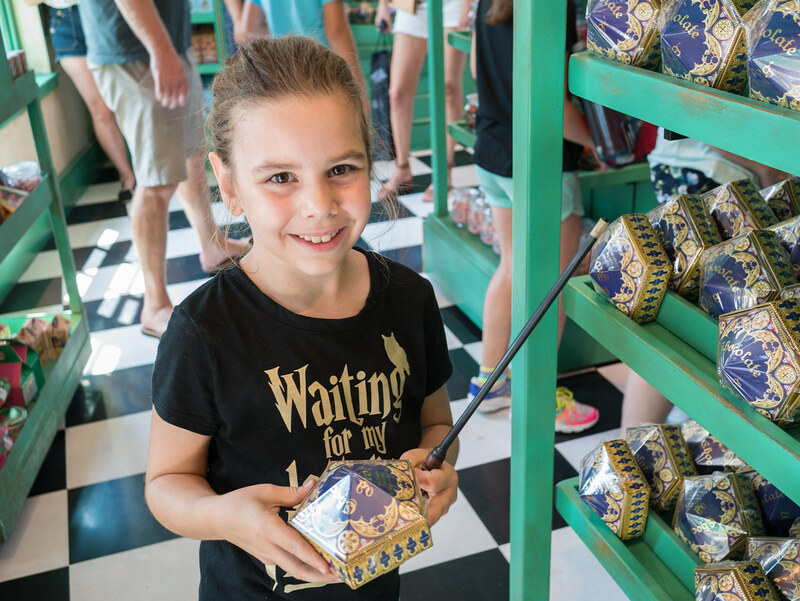 Molly loved her chocolate frog, though she would have preferred a different card than Lockhart. Leah had a giant lollipop that she still hasn’t finished. In addition to the packaged treats, Honeydukes had some fresher options in their glass counter. When I saw they had Butterbeer fudge, I couldn’t pass it up. It was wonderful. We then rode Despicable Me Minion Mayhem, which was a lot of fun. It’s a simulator ride, and has all the fun silliness of the Minions. Then we headed to the WaterWorld show, which was pretty good. We at least got to sit in the shade, though the bursts of fire weren’t helping the heat. As our day was coming to an end, we went back to Olivander’s to buy the girls wands. 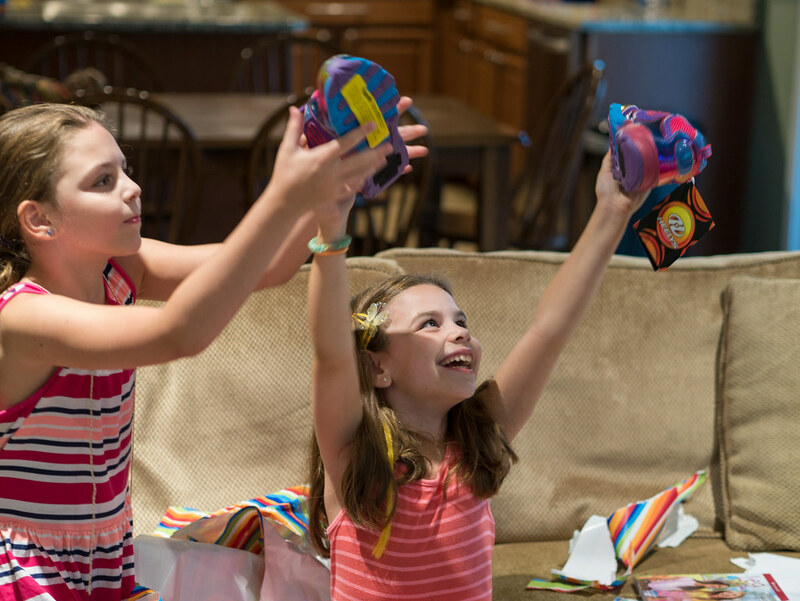 They’ve wanted them for a long time, and we told them they could each get one as a toy/souvenir. 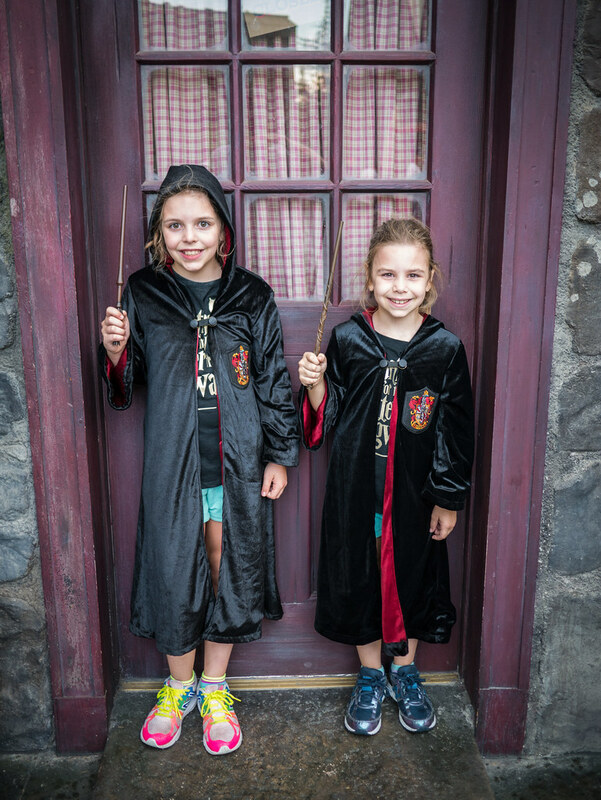 They both chose to get replica wands of characters from the films. 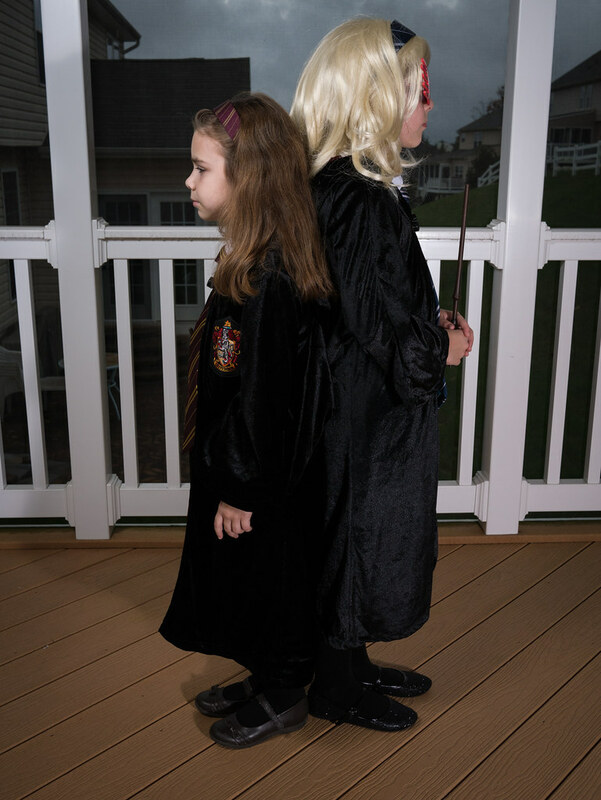 Leah chose Hermione’s wand, and Molly chose Luna’s wand (technically, Luna’s second wand). Sadly, they only got to use them a couple of times before it started raining (you can see the ground is already damp). As it got close to park closing time, it started to rain. This left us with a choice to find a place to hide and hope it passed, or try to leave before the rain got bad. We were hungry and it did not look like it would blow over quickly, so we chose to leave before it got bad. Sadly, it quickly got bad. And as you might expect, it was a long walk to get out of the park and to our car. Soon, we were completely drenched. 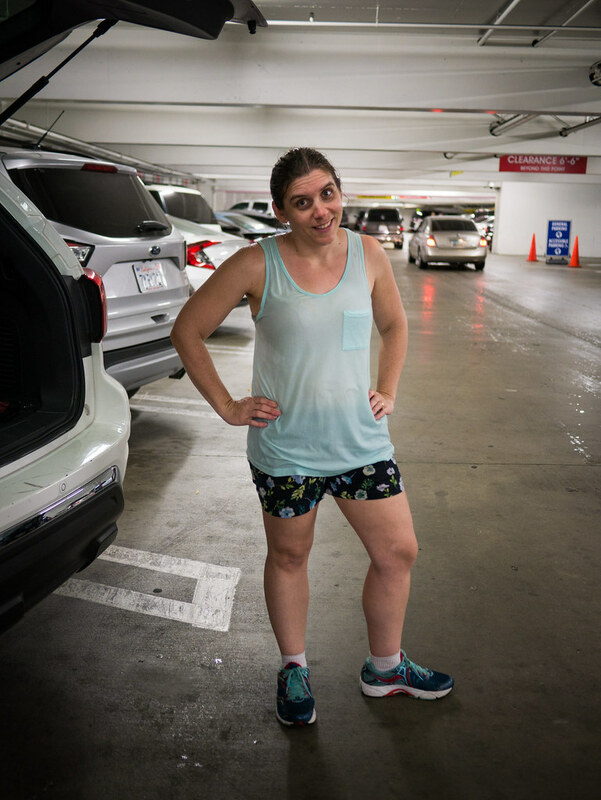 After such an exhaustingly hot afternoon, ending with a long hike through a downpour was a bit too much for Jen. She was not amused. 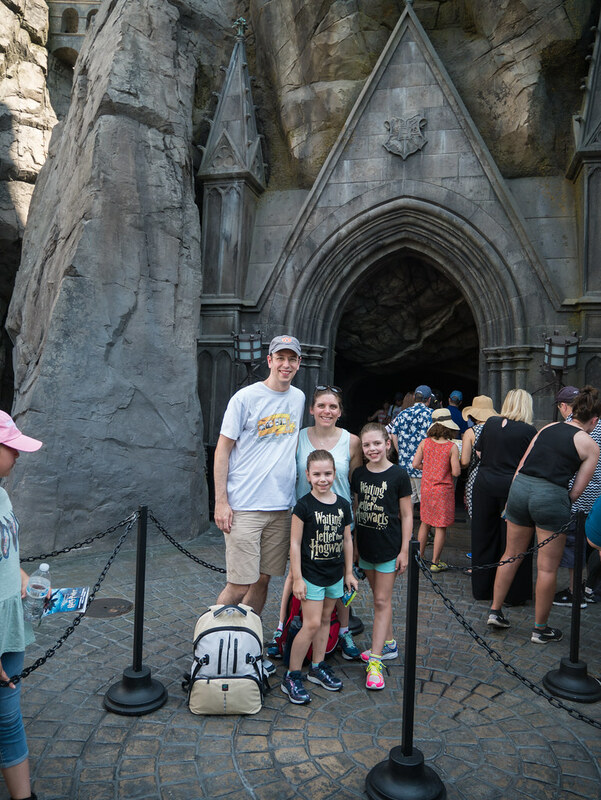 Between the heat, the downpour, and us not being into much of the stuff outside of Harry Potter world, the day definitely had its problems. In my opinion, the awesomeness of Harry Potter world totally made up for all that. Jen may disagree with me.